Time to wrap up my visit to Spring Training. Sorry it took a few days, but there’s plenty keeping me busy with the start of the season exactly one week (!) away. 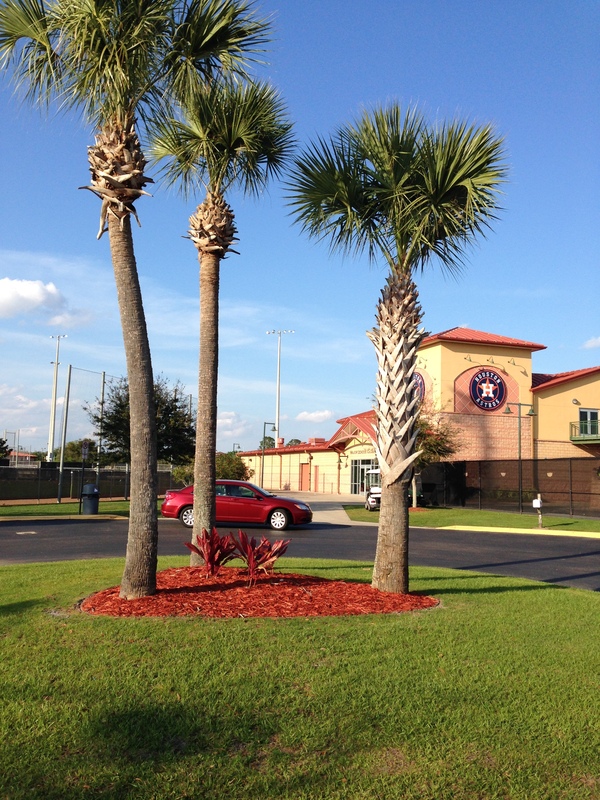 After a couple of days at the Astros facility in Kissimmee, it was time to hit the road. 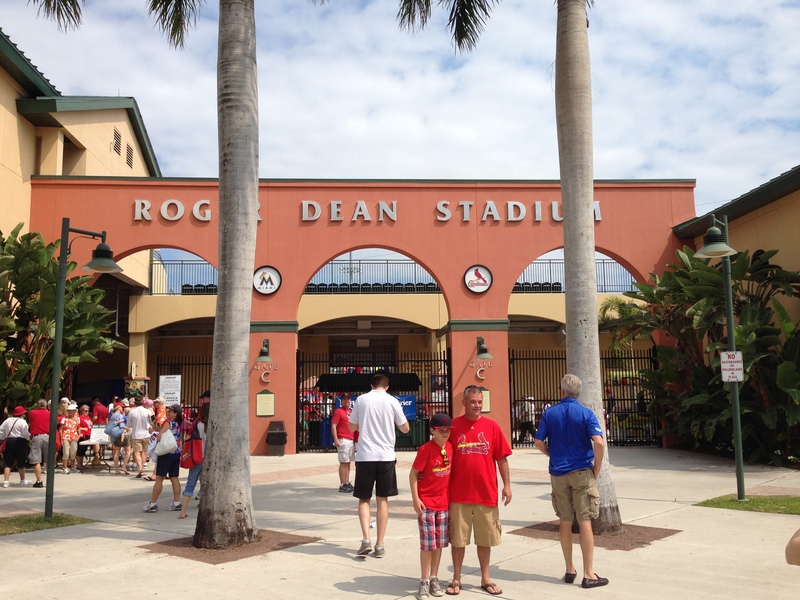 The team headed two hours down Florida’s Turnpike to Roger Dean Stadium in Jupiter—the town, not the planet—to face the Cardinals. 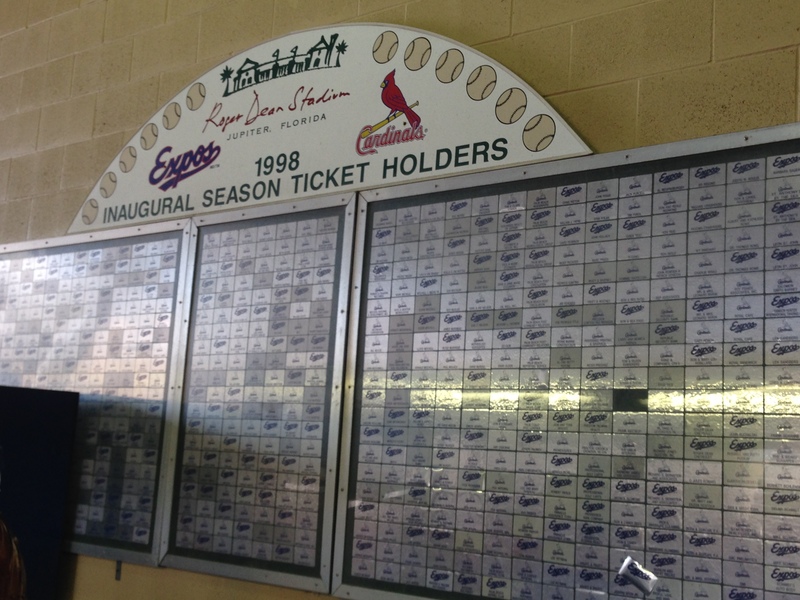 The stadium was built in 1998 and serves as home base for the Cardinals and Marlins during Spring Training. It also distinguished for being the only stadium in the country that serves as the home park for four minor league teams: the Palm Beach Cardinals and Jupiter Hammerheads of the Florida State League and the GCL Cardinals and GCL Marlins in the Gulf Coast League. Astros take BP before their game against the Cardinals. Not only did I get to see another Grapefruit League stadium, but I expanded my culinary vocabulary. 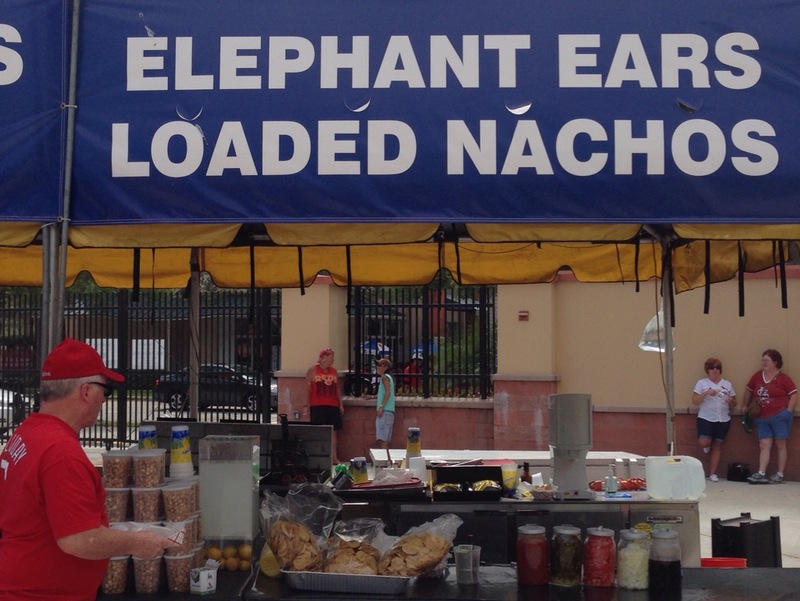 I was quite confused when I saw a concession stand boasting “Elephant Ears,” but it turns out they are flattened pieces of fried dough topped with sugar, fruit, and whipped cream, similar to a funnel cake. It’s not as exotic as the name implies. In front of packed house clad in red, the Astros lost, 6-3. The highlight of the day was an unbelievable sprawling catch by former RedHawk Jonathan Villar. He went well into shallow left field and made a full-extension snag on a pop up right along the foul line that had the entire press box buzzing. Unfortunately the game was not televised, so no video is available. After the game ended, word started to leak out about RedHawks manager Tony DeFrancesco’s health issues. Although I had known already for a few days, the Astros decided it was time to make the official announcement. I’ve seen too many bad things happen to good people in my life, and this is another item to add to the list. Tony takes such great care of himself, but I suppose there are certain things you can’t prevent. Most baseball folks agree that being a Triple-A manager is the hardest job in baseball. Not only has Tony taken on that task for over a decade, but he does an exceptional job at it. The Astros know they have a tremendous asset in someone who can not only adequately prepare players for making the jump to the Majors, but someone who can create and maintain a culture of winning as well. There’s already been an outpouring of support from RedHawks fans and people throughout baseball, and I don’t anticipate it will stop even when Tony returns. Knowing Tony, he goes into every game expecting to win. I imagine he’s going to have the same mentality while battling cancer. Here’s to hoping #11 is back in the dugout as soon as possible. My time at Spring Training was very busy, yet very enjoyable. However, I find it very hard to believe I would’ve had the same experience had it not been for the tremendous hospitality I received from everyone with the Astros. Whether it was working with the broadcast crew, media relations staff, or just getting to know folks from the baseball operations department, I never once felt like a “minor league guy.” Instead of being someone they see once or twice a year, I was treated like I was there on a daily basis. I really can’t begin to express how much I appreciated my opportunity to be experience what I did for a few days. I offered to take a picture of him at work, but he said it would have to be from a distance. I guess it’s just some clubbie thing about staying the background. Don’t say I haven’t ever done anything for you, Mookie! That’s all from Spring Training. The real stuff starts soon. The main reason for my trip was to be a part of the Astros broadcasts for a couple of games. 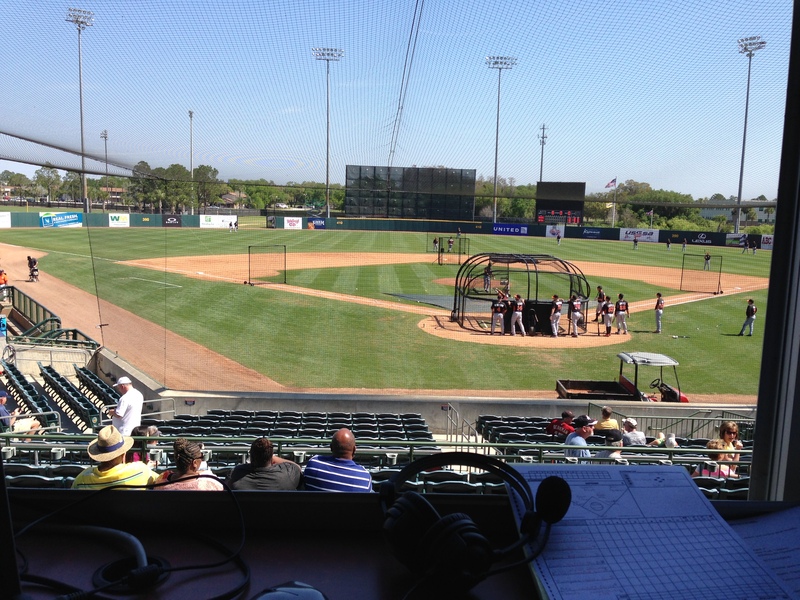 The Astros have radio broadcasts of all their Spring Training games, which is pretty rare. The games are tough to do since there are tons of substitutions and involves keeping track of a lot of players from the Majors and Minors. Also, the road games are all commuter trips, making for some really long days. And remember, this is all done before a 162-game season. So in order to give each member of the regular broadcast team a breather, I was invited to fill-in for a couple of games. I was very fortunate to receive the opportunity, and I was not going to pass it up. The trip hasn’t been all about the broadcasting, as I’ve been able to do some RedHawks-related things as well. Here’s a recap of my first two days. The scenery here is a bit different than Bricktown. 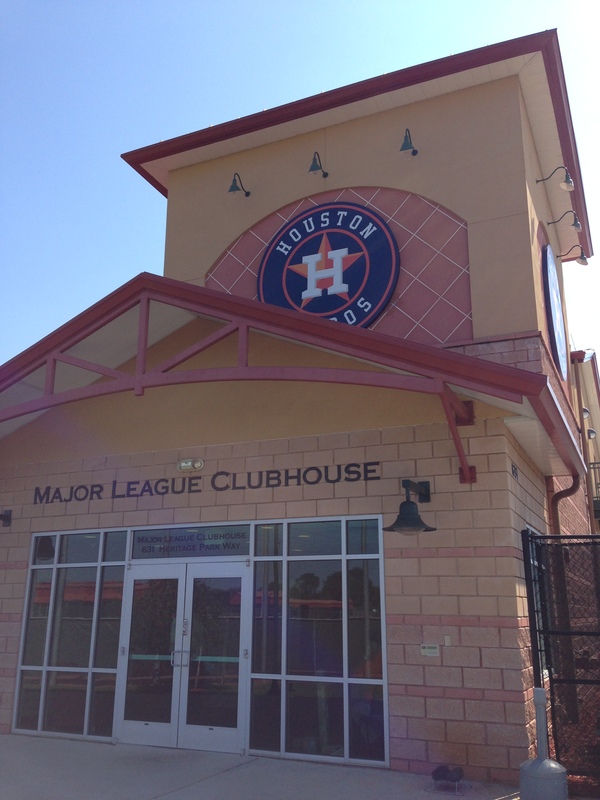 Entrance to Major League clubhouse and administrative offices. 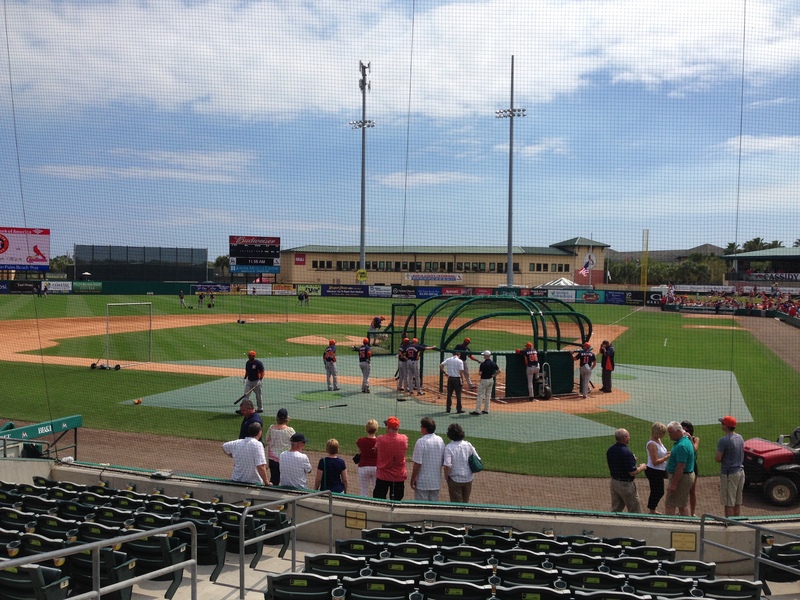 My first day in camp was spent mostly on the big league side getting ready for that day’s game against the Marlins. Turns out I didn’t miss much on the minor league side since the Double-A and Triple-A groups were playing road games. During batting practice I was able to catch up with several players from last year’s team, some of whom could be back in Oklahoma City this season. I also chatted with all the members of the RedHawks coaching staff, including hitting coach Leon Roberts, who was in his usual spot at the cage. 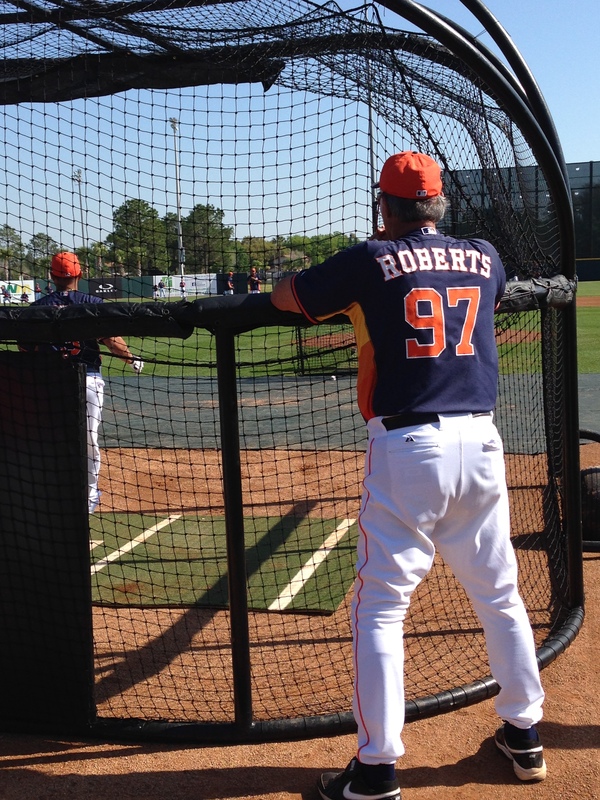 Leon Roberts observes batting practice, as he is wont to do. 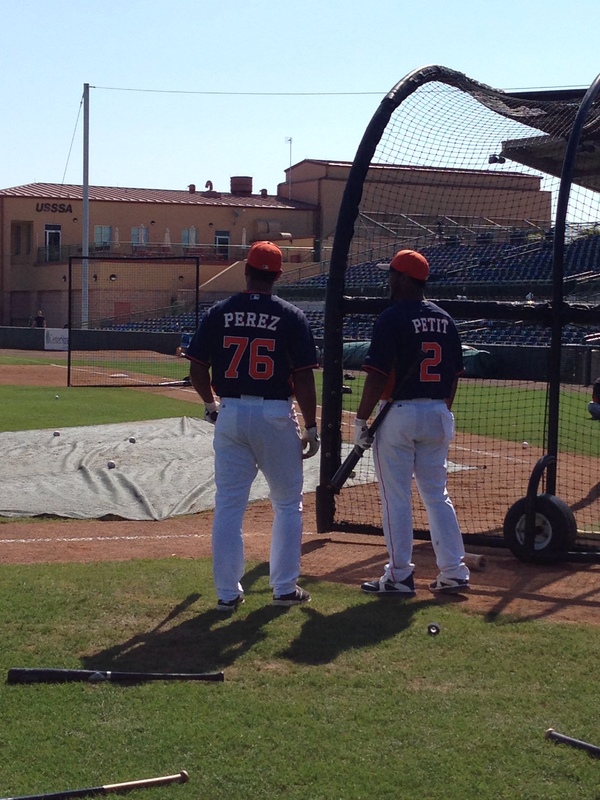 Two players likely to start the season in Oklahoma City: Carlos Perez and Gregorio Petit. The game between the Astros and Marlins featured several former RedHawks, including a couple who made stops in Bricktown several years ago. Astros starting pitcher Scott Feldman (2006, 2007) and Marlins catcher Jarrod Saltalamacchia (2008, 2010) both suited up for the RedHawks when the team was affiliated with the Rangers. 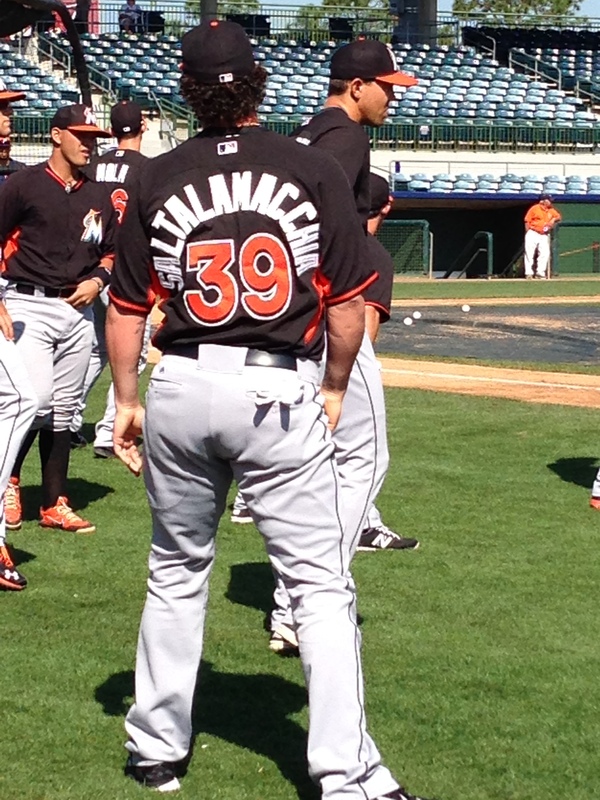 Jarrod Saltalamacchia gets loose before the game. The Astros fell, 7-2. The Marlins seized control of the game with three runs in the fifth inning, due in large part to a couple of Astros errors. RedHawks alumni Robbie Grossman and Marc Krauss each scored one of the team’s two runs. Josh Zeid also had a nice relief outing, striking out four straight batters at one point and drawing high praise from manager Bo Porter after the game. Later that night I attended a BBQ hosted by Astros media relations director Gene Dias. The food was prepared by broadcast engineer Lowell Matheny, and it was all superb. Lowell’s signature fried ribs were a big hit. I made sure to get to Osceola County Stadium a bit earlier in order to spend some time on the minor league side. I was able to catch some of the Triple-A group’s workout. Keep in mind these are only work groups, and just because a player is in that group doesn’t necessarily mean he will be assigned to that team. The team played a game against the Braves later in the day, but since it was at the same time as the big league game, I didn’t get to see it. Tom Lawless hits fungoes during a minor league workout. After that I headed over to one of the bullpens. Most of the pitchers throwing at that time were players who are more likely ticketed for A-ball or Double-A. 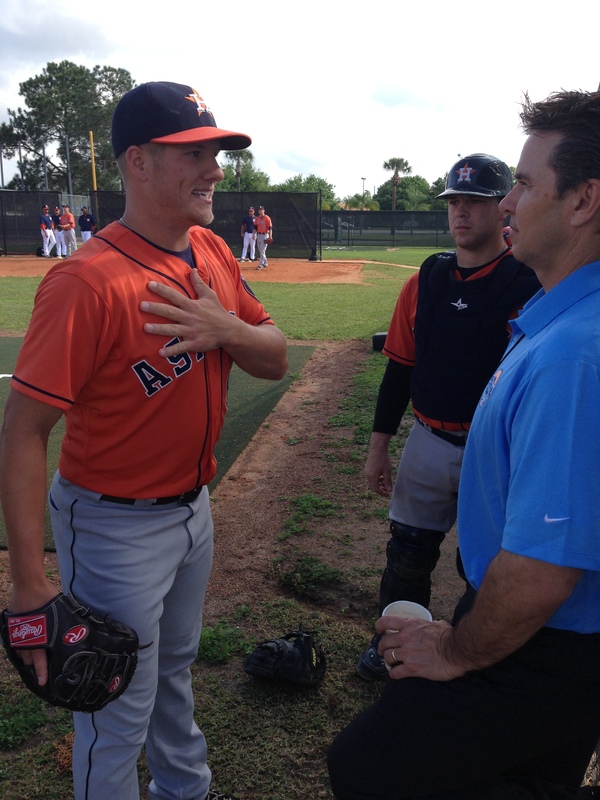 The highlight, though, was listening to a conversation between Astros broadcaster–and former knuckleballer–Steve Sparks chat with knuckleball pitcher Blaine Sims. Blaine Sims and Steve Sparks talk shop. Sims picked up the pitch within the last year or so, and from what I understand, he’s really improved. The Astros were intrigued enough by the development of the pitch that they plucked him in the minor league phase of this past year’s Rule 5 Draft from the Braves. Sims probably won’t be in Oklahoma City this season, but he’s a guy to keep an eye on. The Astros squared off the Cardinals, and as is the case wherever the Cardinals play, there was a throng of red in the stands. St. Louis jumped out to a quick 4-0 lead in the first inning against former RedHawk Brett Oberholtzer and went on to win 5-2. Cardinals pitcher Michael Wacha looked like the reigning National League Championship Series MVP that he is, keeping the Astros quiet over seven strong innings while featuring several devastating changeups. After all the scheduled Astros pitchers threw, Ross Seaton finished the game with a 1-2-3 ninth inning. 2013 was a tough year for Seaton, which he spent mostly with the RedHawks. However, he’s gotten into a couple of Grapefruit League games this spring and has performed well. Hopefully it’s a sign of things to come this season. I’ll be hitting the road Sunday as the Astros face the Cardinals again, but this time at Roger Dean Stadium in Jupiter, Florida. I’m looking forward to seeing another stadium down in these parts. My next post will recap that day, as well as provide some closing thoughts on my time down here. Two weeks from tomorrow the RedHawks will be playing ball. 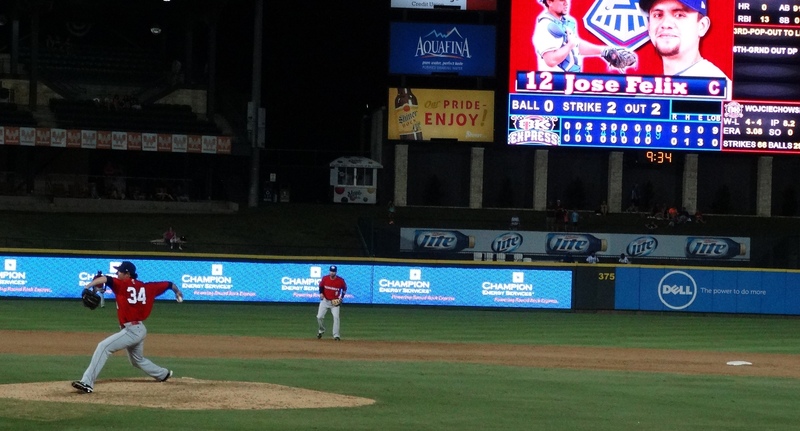 Hard to believe, but the season truly starts in a fortnight at Dell Diamond in Round Rock. It’s a statement that induces a lot of joy, but also some anxiety since there’s still a lot to get done. It’s been far too long since my last post, so let’s take a look at some of the things that have transpired between now and then that will have an impact on the season. Before I dive into the rest of the post—and to avoid “burying the lede”—an important programming note: I will be at Astros Spring Training in Kissimmee, Fla. Friday-Sunday. The plan is to write a new post each day, but since it’s my first time there, I’m kind of going into it blind. Regardless, be on the lookout for pictures and all sorts of other fun stuff through the team’s Twiter (@okcredhawks), Instagram (@okcredhawks), and Facebook (facebook.com/okcredhawks) pages. 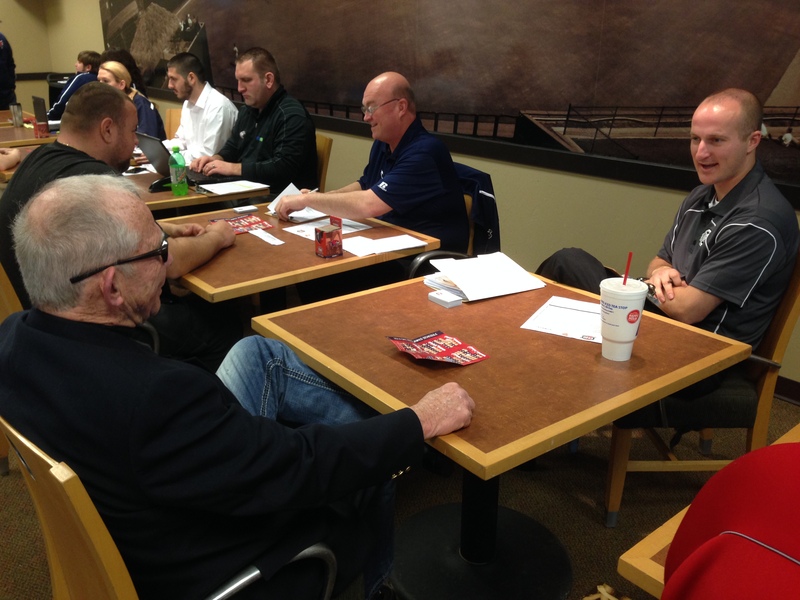 On Feburary 28 and March 1, the RedHawks hosted the team’s annual job fair. Despite some lousy weather both days, the turnout was outstanding. Job seekers went through “the gauntlet” at the job fair. Gameday employees are the unsung heroes of gameday operations. If a fan has a question or concern while at the ballpark, that fan isn’t going to know what a full-time member of the front office looks like. Odds are good the fan will find the first person in sight wearing a staff shirt, and more likely than not, that person will be a gameday employee. The department managers who were hiring during the job fair walked away very satisfied with the quality of candidates and are confident they were able to add some great new team members. 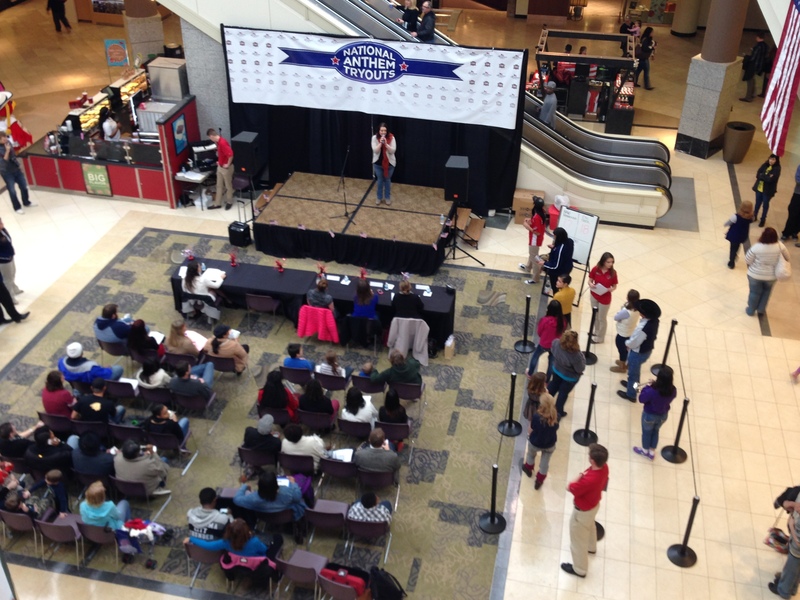 Just a week later, it was time for the annual National Anthem Tryouts at Penn Square Mall. I don’t just say this, but it seemed like the performers we had this year as a whole was better than the past. These guys came dressed for the occasion. Bird’s eye view of the National Anthem Tryouts. If you weren’t able to make it Penn Square Mall, you can get a brief glimpse through this video. Between the tryouts and other submissions, Enterainment Director Shannon Landers has listened to 250 renditions of the National Anthem. I don’t think she’ll have trouble finding 72 quality performances to appear throughout the season. This is going to sound odd, but I rarely get to eat the food at Chickasaw Bricktown Ballpark. The folks with Professional Sports Catering put out great stuff every night, but the problem is, I’m kind of occupied when the food is being served. Fortunately I had the chance to be part of a tasting for new items to be featured at our specialty burger and hot dog stands, Burgertopia and Franx. I sampled six burgers and seven hot dogs, and they were all very tasty. 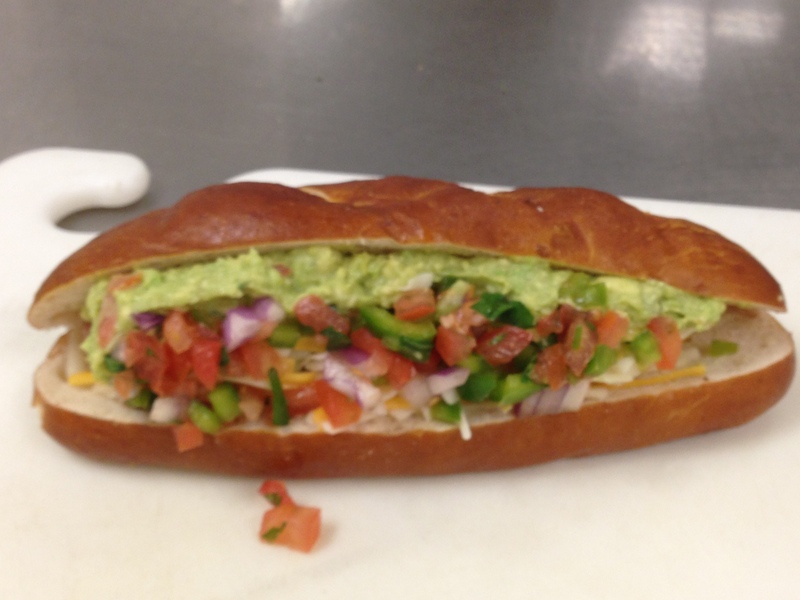 My favorite hot dog was the Guac Dog, which is topped with guacamole, cheese, and pico de gallo. The Guac Dog. Topped with stuff usually reserved for nachos, but trust me, it works. As for my favorite burger, I’m gonna roll with the Philly Burger, which is topped with Philly beef, onions, green peppers, and cheese sauce. There aren’t too many better burger toppings than another kind of meat. 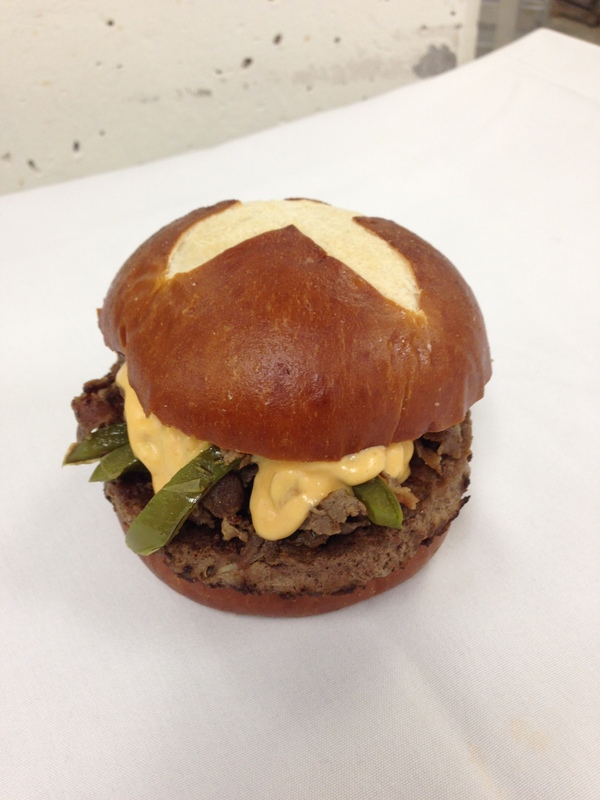 Philly Burger…coming soon to Burgertopia. To take a look at some of the other new creations, check out this video. Some leftovers from the tasting. 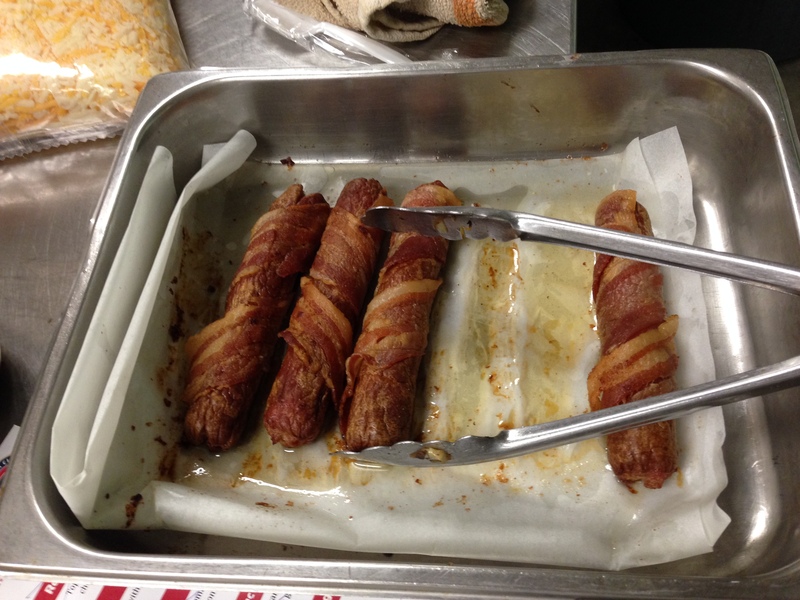 If you’re asking youself, “Why would he post a picture of bacon-wrapped hot dogs?”, I would ask you to politely stop reading now. We’re clearly cut from different cloths. 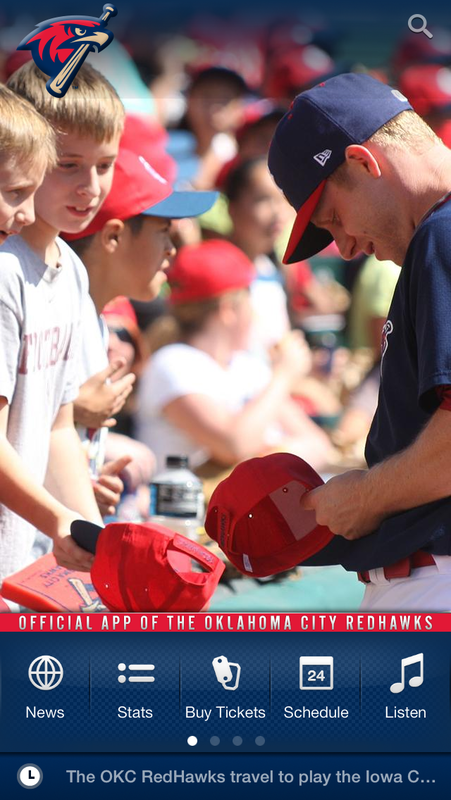 In case you haven’t heard, the RedHawks recently released an official team app. It’s been in development for awhile and has a bunch of features. The app is available on the App Store and Google Play. It’s free, so go check it out. Homescreen of the new RedHawks app. 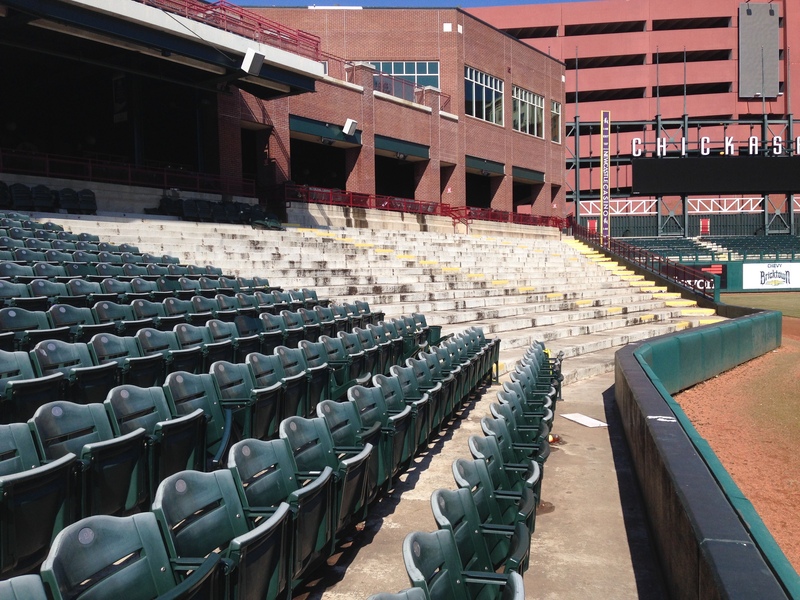 Although the RedHawks will not play their first game at Chickasaw Bricktown Ballpark until April 11, there are baseball games going on throughout this month. The Majestic Roofing High School Baseball Series is in full swing, and all the games are free to attend. Click here for a full schedule. 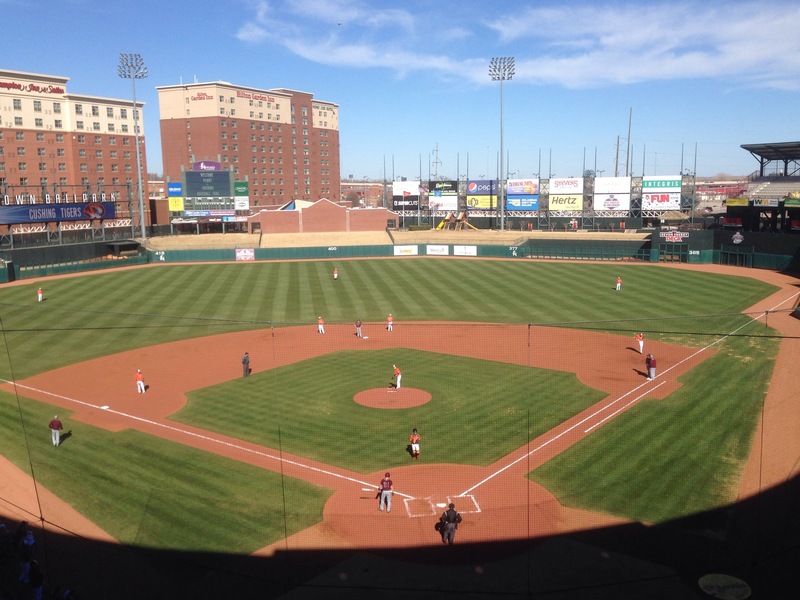 Perry and Cushing dueled it out in Bricktown on March 13. Time to get back to writing the media guide and working on all the other stuff on my to-do list. Thanks for reading. I feel like I start most of my posts with something along the lines of, “It’s been too long since my last post.” Well…that’s how this one is going to start as well. As you might figure, the closer we get to the beginning of the season, the progressively busier I get. There’s been a lot going on around these parts of late. Take, for instance, the last week of January. 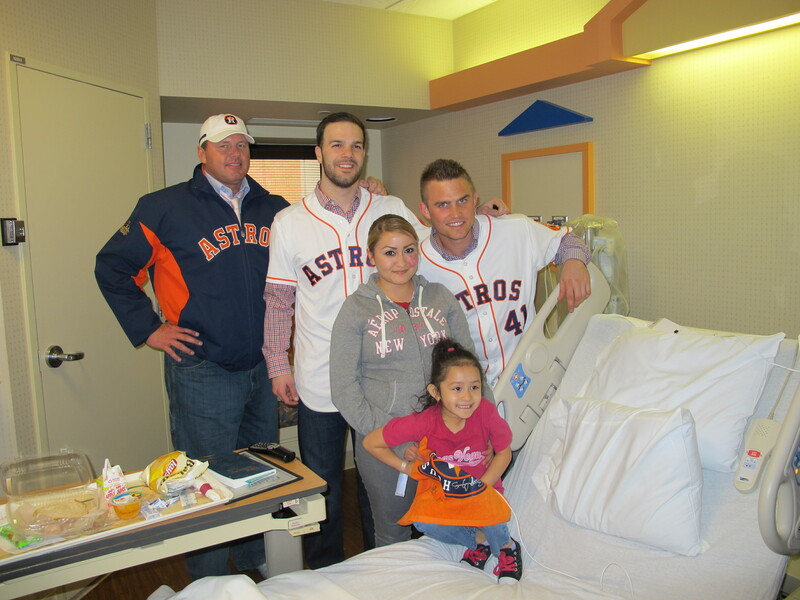 It started off with the Astros Caravan stopping in Oklahoma City for a jam-packed day. The Astros really beefed up their caravan efforts this year, increasing the amount of cities they visited from eight in 2012 to 31 in 2013. We were really fortunate to have such a great group come to OKC: Current Astros Dallas Keuchel and Max Stassi, MLB legend Roger Clemens, and Astros Owner/Chairman Jim Crane. There were a couple of events at the ballpark for season tickets holders and sponsors, but the schedule also included a visit to the pediatrics unit at INTEGRIS Baptist Medical Center, a stop at the National Softball Hall of Fame and Museum, and an autograph signing at Academy Sports + Outdoors. I’ve shared some pictures below, but you can check out more here. I wrote something similar after last year’s caravan, but it bears repeating: I was unbelievably impressed with how enthusiastic and involved those representing the Astros were. You could tell they truly wanted to be there and enjoyed being a part of it. The very next night was the annual Warren Spahn Award Gala. It’s a wonderful event put on by Bricktown Rotary and something the RedHawks enjoy being a part of it. The award is presented to the top lefthanded pitcher in baseball, and this year’s winner was–no surprise–Clayton Kershaw. The reigning NL Cy Young Award winner was pretty concise with his acceptance speech, but his wife spent a lot of time talking about their charity, Kershaw’s Challenge. 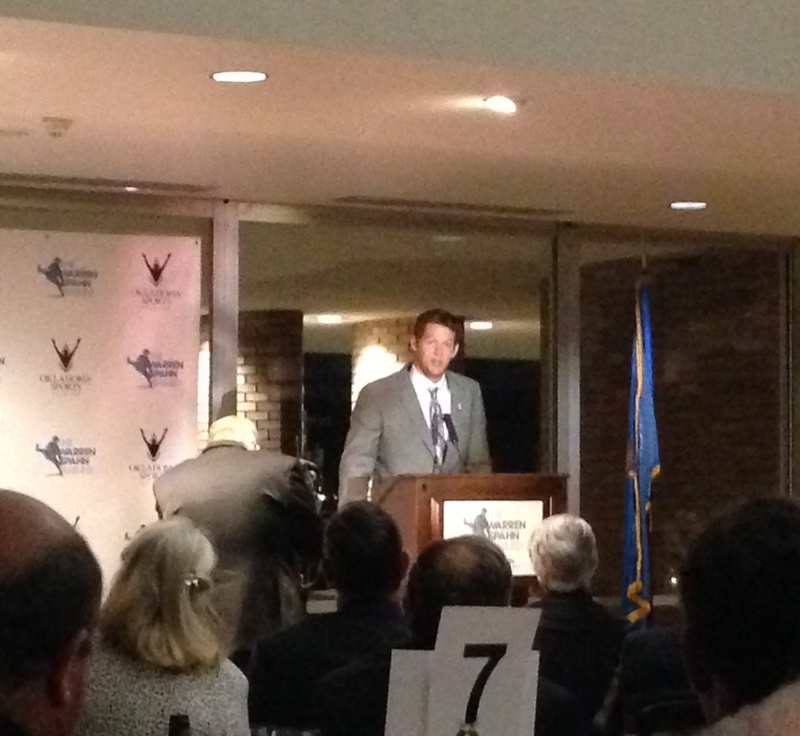 It’s a very admirable cause, and Bricktown Rotary presented a donation at the end of the night. Also, big shoutout to event emcee—and Washington Nationals broadcaster—Bob Carpenter. He led a rousing rendition of “Take Me Out to the Ballgame” and emphatically boasted, “Root, root, for the REDHAWKS!” We definitely got a kick out of it. It’s now less than two months from the first game at Chickasaw Bricktown Ballpark (April 11 versus those darned Zephyrs of New Orleans). As an organization we want to constantly improve the ballpark in ways both big and small. 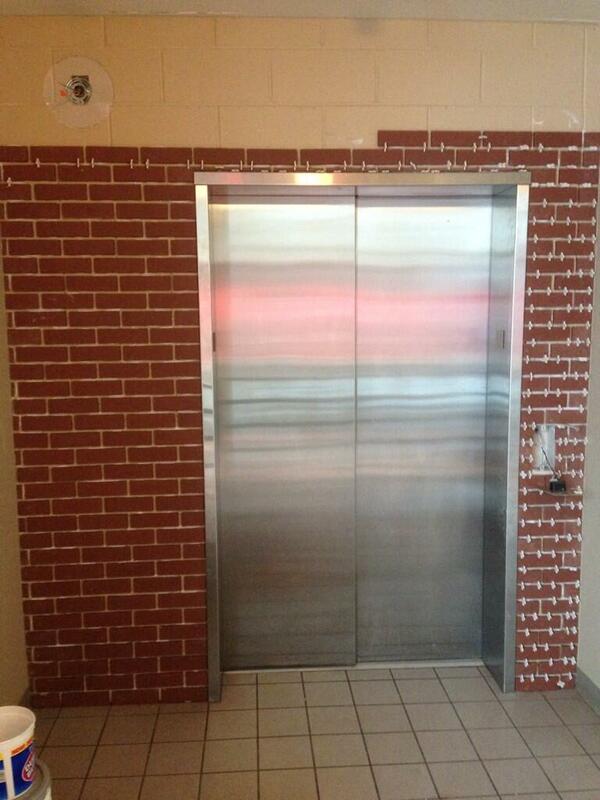 There’s a couple of projects going on at the moment, including putting in new brick facades around the elevators. Another renovation is converting the seating down the left field line from bleachers to chairbacks. These will provide more comfort, better views, and actually increase capacity by a bit. Although we pride ourselves on unsurpassed customer service, we are always striving to improve that as well. The RedHawks Job Fair is coming up at the end of this month, and we’ll be looking for great people to fill roles ranging from guest relations to food and beverage. You can find all the details here. 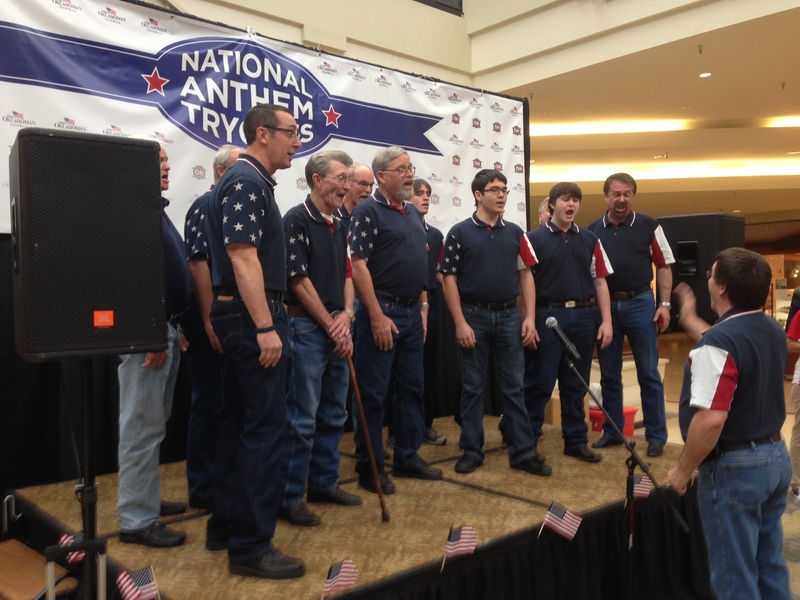 We’ll also be holding our annual National Anthem tryouts March 8 at Penn Square Mall. All of the advance registration slots filled up within a matter of days, but you can still tryout on a standby basis. If you want to see if you have what it takes to sing at a RedHawks game, click here. Spring training for the Astros begins this weekend in Kissimmee, Fla. Mlb.com’s Brian McTaggart has you covered with the main storylines to watch. The Astros have 25 non-roster invitees to big league camp, which is much higher than average. It’s not surprising, though, given the fluid state of the roster. Most of these guys have either already spent a good amount of time with the RedHawks or will do so in 2014. However, I’m not quite ready to play the prediction game yet. In fact, I’ve made it known before I’m loath to do it publicly anyway. Too many things can happen between now and April 1. I will say, though, I fully expect the RedHawks to have another really good team due to high amount of talent currently in the Astros farm system. The one player I am willing to make an exception for is George Springer. I have received many questions regarding if he will begin the season in OKC. As of now, my gut says yes, although I don’t think it will be for long. Not only will it give him a chance to get further adjusted to playing every day in right field, but this article by Evan Drellich also explains why it would make sense in terms of Springer’s eventual Major League service time. By the way, if you care a modicum about the Astros, you need to make sure you are following Brian (@brianmctaggart) and Evan (@evandrellich) on Twitter, although I bet most of you reading this already are. Throughout spring training the Astros, like every other team, will make a few roster moves. After signing veteran pitcher Jerome Williams last week, the Astros designated Brett Wallace for assignment. He recently cleared waivers and will be outrighted to the RedHawks for now, but he will have a chance to compete to rejoin the Astros during spring training. When you have a job like I do, your rooting interests shift from teams to individuals. You build relationships and want to see certain people succeed regardless of what organization they are with. I understand these relationships are able to be founded since I am fortunate to have access only a small percentage of people are allowed to have. Even though a lot of my job requires me to be objective, there are situations where personal bias is going to enter. I’m going on my seventh year of working in baseball, and I can say Brett Wallace is in the upper tier of hardest-working people I’ve encountered. He’s been asked to do so many different things regarding his approach, and every time he’s gone right to work without complaint. I had two separate conversations with folks with Astros ties shortly after the news broke. Both happened to use the same exact term to describe him: consummate professional. It’s completely accurate and appropriate. When people say less than flattering things about someone they never met, I’d like to think they wouldn’t say those things if they knew the full story. But at the same time something like this does strike a bit of a personal chord. 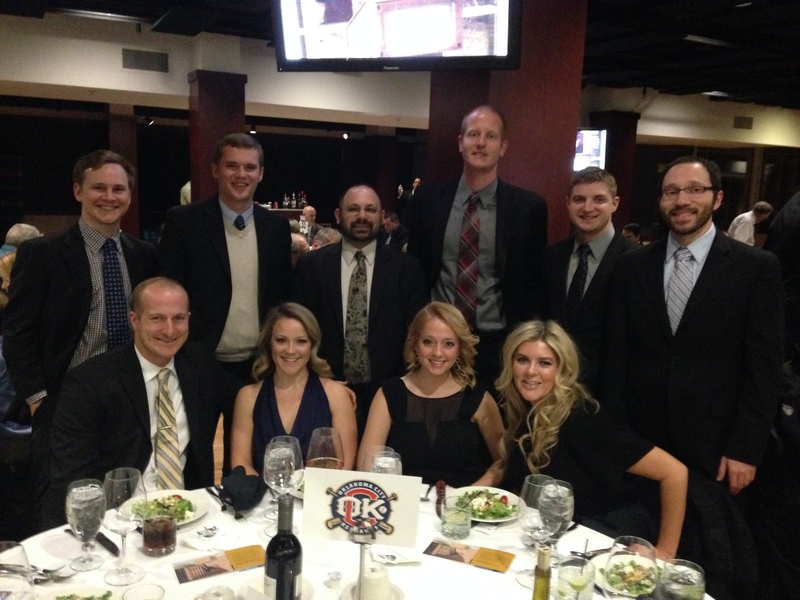 Recently I received some nice news that the team, and our broadcast partner 1340 AM “The Game”, was selected as the 2013 winner of “Best Play-By-Play” by the Oklahoma Association of Broadcasters. In a state filled with great broadcasters and broadcasting outfits, it’s nice to earn this recognition. It wouldn’t have been possible without the effort of several people. The award is a good little addition to the mantelpiece, but the work is far from complete. I tell people broadcasting a baseball season is akin to taking a test 144 times per year, and I will not be satisfied unless I get an A every single time. It’s nothing like performing surgery or making real change in the world, but it’s something that requires a lot of hard work on a daily basis. As always, thanks for reading. And remember, the battle is a lot easier when you are fighting for #teampie. Hope everyone had a good holiday break. There are a few things I want to cover, so let’s dive in. A typical question I get during the off-season is, “When do you start to get busy?” Well, I’m always busy, but once the calendar hits January 1 is when things really start to pick up. At the end of last week I started to plot things out on the calendar between now and Opening Day (April 3), and there’s a lot on the horizon. In the the very near future we should be announcing our 2014 coaching staff. 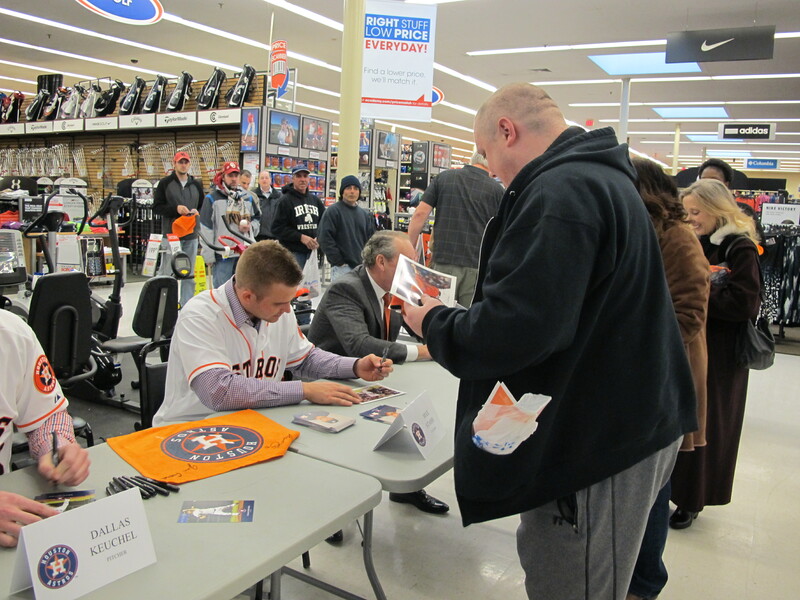 Also, we’re starting to get ready for the annual Astros Caravan, which will come to OKC on January 27. All the details will be available soon. Throw in National Anthem Tryouts, the Gameday Job Fair, and oh yeah, all the baseball information stuff (media guide, stats, etc.) just to name a few, and it’s easy to see time is starting to become a precious commodity. Still no official word from the Astros on minor league free agents, although mlb.com’s Brian McTaggart recently reported the Astros signed pitcher Peter Moylan to a minor league deal. You can find his stats here. However, the Astros have been fairly active with free agent signings to bolster to the big league club, which should create a domino effect upon the RedHawks roster. After signing guys like Scott Feldman, Chad Qualls, Matt Albers, and Jesse Crain, it means younger players who might have been slated to make the Astros will end up in OKC instead. The guy behind all those moves is Astros General Manager Jeff Luhnow. I highly recommend listening to this podcast he recently did with Jay Mohr. It’s lengthy, but well worth it. The great thing about the podcast is that it’s not really baseball heavy. Instead it mostly focuses on Jeff’s career path and how he applies his background in both management consulting and engineering to his current position. I’ve been fortunate to get to know Jeff a bit the past couple of seasons. I appreciate how he’s always willing to chat and his candor while doing so. The podcast reinforces he’s very committed to sticking to the plan he and his team have put in place to revive the franchise. Yesterday the Astros announced a series of coaching moves. Third base coach Eduardo Perez resigned in order to spend more time with his family, and as a result, first base coach Pat Listasch will slide across the diamond to fill that role. 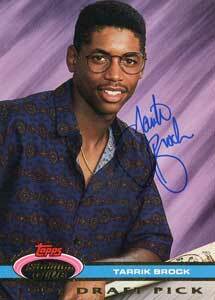 The Astros then hired Tarrik Brock to be the team’s new first base coach. He spent the past seven seasons with the Marlins as the minor league outfield and baserunning coordinator. So, so many early 90’s things going on in that picture. Simply outstanding. I have been delaying this post was because I wanted to wait until after the Hall of Fame results were announced. By all accounts it seemed Craig Biggio was going to get in, and I had it planned out how I would write about what a great moment it was for the Astros and the city of Houston. Of course, it didn’t quite work out that way. He fell two measly votes shy. 2013 was a tough year for Houston sports, and this was not an ideal way for 2014 to begin. I’ve gone on record in the past discussing how my support of Biggio has nothing to do with the RedHawks being an Astros affiliate. I really feel for him since he’s going to have this lingering for another year. I also feel for the Astros and all their fans, who are anxiously waiting for the first true Astro to be inducted into the Hall of Fame. A few people have hypothesized that he would have gotten in if voters were allowed to select more than 10 players. This makes no sense to me. Outside of the three that got in, were there really seven more worthy candidates on the ballot than Biggio? Let’s even take it a step further. I personally believe Barry Bonds and Roger Clemens should both be in–that’s a whole other conversation–and even in that case I find it hard to believe you could include five others, but not Biggio. There’s has also been a narrative developing that he was part of a “stacked” ballot. Like this year’s ballot, next year’s will feature three sure-fire Hall of Famers: Randy Johnson, Pedro Martinez, and John Smoltz. Not sure how that make it any easier, but results tend to usually improve with time. However, we shouldn’t let Biggio’s omission completely overshadow how three well-deserving players did get the nod. This is really the first class full of players from “my generation.” I’ll touch on all three briefly. Like most kids who were not Braves fans, I couldn’t stand him because he was just so damn good and would usually beat my team. Now that I’ve grown up, I have a huge appreciation for his career and his modus operandi. I described Asher Wojciechowski’s complete game this past season as “Maddux like” because he did so using only 97 pitches. Thing is, Maddux would routinely throw complete games using much less than that. Former big leaguer and current ESPN analyst Doug Glanville wrote a great piece about what it was like to face Maddux. The headline says it all. I don’t really have an anecdote about him, but he’s prominently featured in one my favorite books, Living on the Black. It’s a wonderful read. Easily my favorite non-Cardinal as a kid. My father was once at a function “The Big Hurt” was at and got me his autograph. I thought it was the coolest thing ever, and I kept it meticulously protected in a very specific location. Who knows where it is now, but for many years I considered it a prized possession. We’ll end on this. Things are a bit different around the office these days. In the weeks preceding the end of the year, we lost some really, really good people to other opportunities. It’s a bittersweet situation. I’m very happy those individuals are able to further their professional lives, personal lives, or both, but at the same time, I wish they were still here. I’m not going to eulogize or embarrass them, but they know who they are. The sports business is a transient one both on the field and in the front office. Players get promoted, traded, or released. Coaches are widely recognized as nomads. On the business side, we work crazy hours, and most don’t get rich doing it either. Those factors plus an unending crop of people who want to work in sports equals a fair amount of turnover. Although we sustained some losses, it created opportunities for others. We’ll always have memories with those from our past, but we can always look forward to creating new ones with those in our present and future. Before I go off the philosophical rails, I’ll bring this to an end. Thanks for reading. Did you know you always wanted to do this? No, not at all. I never really even entertained the thought until late in college. As a kid, I remember how I told people I wanted to be a lawyer or a comedian, because we all know how hilarious attorneys are. Eventually I went to college with the intention of studying journalism and becoming a news or sports reporter. About two years or so into school, I realized that line of work wasn’t going to be for me. There were other periods I went through where I entertained the thought of going to law school, work on documentaries, or do sports-related TV production. All the while I was doing all sorts of broadcasting, both sports and music, just for fun. Graduation was getting closer and I didn’t know what the future was going to hold. Most of my friends were set on going to law school, med school, or starting careers in the financial sector, but I was one big question mark. While I was in school I worked part-time at a TV production company. A couple of staffers there knew of my dabbling in broadcasting and suggested I try it professionally. The rationale was there would be no better time to try than right after graduation. I landed a job before the next baseball season with a High-A team in California and have now been at it for about six years. I consider it to be one of the very few things in life I’m good at–and even that’s debatable–so I can’t really imagine what else I would be doing. What’s a typical day like during the season? Seriously though, it’s a jam-packed 12-13 hour day (or longer) you do at least 144 times. Even though we’re right below the major leagues in terms of player advancement, there’s a big gap from an operations and resources standpoint. Between me and my department mate Lisa, we do the equivalent of what seven people do for the Astros. -Write game notes, distribute them to media, and post them online. 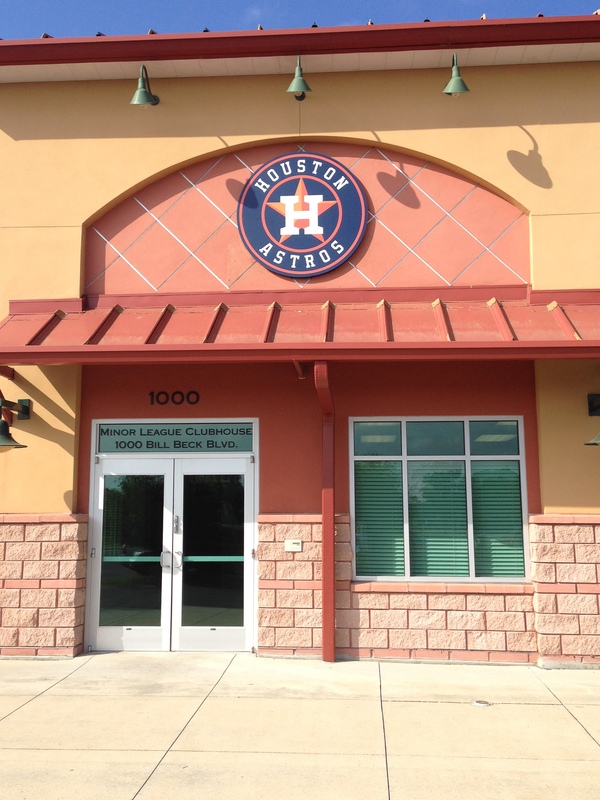 -Check with Astros player development staff regarding any roster changes. If so, submit new roster to the league and opposing team. -Gather and distribute both team’s lineups. -Write game recaps and post game highlights online. I’m probably forgetting some things.That’s just stuff you know that’s going to happen on a daily basis, but there’s always last-minute stuff that arises you have to deal with on the fly (lineup changes, credential requests, etc.). There’s also other times that require extra press releases, interviews, etc. And that’s all in addition to my broadcast prep. Now doing a broadcast isn’t anything like having to preform surgery, but you can’t just roll out of bed and do it. I talk every night for a minimum of three hours by myself, so I need to know what I’m talking about (or do a good job faking it). Going into each game, there’s a lot to digest, but of course there’s no script, so you have to be able to adjust accordingly to what’s happening on the field. Like I said, it’s pretty busy. You just do it. Whether it’s sacrificing sleep, meals, or any kind of a life outside of work, you just do what you need to do to make it happen. I know it’s not a very enlightening answer, but it’s the truth. Doesn’t matter. I don’t miss games. If I’m under the weather, I’ll load up on meds, tea, and water. I’ve called games when my voice was shot, and I could barely speak. If I’m going to miss a game due to something health-related, I better be wearing a toe tag. The only time I’ve missed a game was this past season for my brother’s college graduation. And I was even hesitant to leave for that. Do you work for the team during the off-season? Of course. Writing this is part of my job. Overall my off-season is dedicated to various projects, such as cleaning up team statistical records and tending to things neglected during the season. I also do a lot of speaking engagements within the community. Once the calendar turns to the new year, that’s when a lot of the baseball prep begins. I’ll start working on the media guide, hire press box employees, and anything else I need to do get us in position to be ready for the start of the season. Obviously, the closer we get to opening day, the days get longer and there’s more that needs to be done. There’s also a few off-season events of which I’m in charge of leading the media promotion, such as snow tubing, our annual job fair, and National Anthem tryouts. Do you broadcast any other sports besides baseball? Yes. Since moving to Oklahoma City, I’ve picked up some freelance assignments for football and basketball here and there, but nothing on a regular basis. Hopefully that will change. I also have experience broadcasting hockey and volleyball. They’re tough to do. Do you have any superstitions or routines you have to follow? No. I do have a certain way of writing things in my scorebook, but that’s about it. I would also like to debunk a very popular myth: There is absolutely no such thing a “broadcaster jinx.” As a broadcaster, my first and foremost duty is to inform the audience of what is going on in the game. If that means a pitcher has not allowed any hits, then so be it. If you think I have any effect on what happens on the field, then not only are you giving me way too much credit, but you are also much crazier than I thought. There are tons of time where broadcasters mention hitting streaks, no-hitters, etc. and nothing negative happens. People conveniently don’t remember those instances. Take a moment to read this article. I hate to break it to you, but Jered Weaver was going to throw a no-hitter regardless of what Victor Rojas and Mark Gubicza said that night. Do you have a signature call for a home run or anything else? No. You have to be malleable to the situation at-hand, so if you have a canned line you’re set on using, it might not fit. I’m a big believer on letting the moment occur and then do what feels natural. There was one tradition born near the end of the 2012 season, though. After a nice win, the bump music leading into the post-game show was “Party Train” by The Gap Band. To that point, I had never heard the song and thought it was fantastic. So after every RedHawks win we play “Party Train” during the post-game show, and I’ll usually make a reference to it. What’s traveling on the road like? This topic will get it’s own post in the near future. There’s a lot to cover. What’s your favorite road stadium/city? AutoZone Park in Memphis. It’s a big league stadium, just on a smaller scale. The whole operation there is top notch. Dell Diamond (Round Rock) and Isotopes Park (Albuquerque) are also great facilities, but they don’t have the same setting and feel as Memphis. Before I talk about my favorite road city, you have to understand the thing Triple-A players, coaches, and broadcasters care about the most when it comes to road destinations: how close the hotel is to the ballpark and how much stuff is around. With that being said, Memphis is also at the top of my list since we stay near the ballpark downtown and there’s plenty of restaurants/bars/fun stuff in the vicinity. This might surprise some people, but I would say Des Moines is a close second. Great hotel within walking distance of the park and a nice downtown. If we happen to be in town on a Saturday, I really enjoy going to the downtown farmers’ market. From a non-baseball standpoint, Nashville is easily my favorite city in the league. However, my schedule doesn’t really allow me to play tourist. Any crazy stories from the road? Not really. Due to the busy schedule, especially on travel days, I’m wiped out once my work is done for the night. I might occasionally enjoy a post-game beverage, but I don’t really partake in any late-night shenanigans. So who’s your favorite broadcaster? Tough question to answer, mainly because I don’t have a chance to listen to many other baseball broadcasts and there are probably too many great ones to list. I am very fortunate that my favorite non-baseball teams have incredible broadcasters, such as John Kelly of the St. Louis Blues, Dave Eanet of Northwestern, and Mike Kelly of Mizzou. They’re always a pleasure to listen to. Pound for pound, I think ESPN’s Dan Schulman is the best. He’s a total pro and is so versatile, although I think he’s best at baseball. For being ESPN’s top guy, there’s not a lot of fanfare surrounding him. Although he mostly does TV work, he will do radio for ESPN’s coverage of the MLB playoffs. It’s wonderful. As a college basketball fan, I also love Bill Raftery. He’s known for some excitable expressions, but he brings the perfect blend of color and analysis to a game. I don’t try to model what I do after anyone specifically. You can take small influences here and there, but I’m a big believer that you gotta be your own person. Who’s the best player you’ve ever seen? Another tough one. Since I’ve worked at the lower and upper levels of the minors, it’s hard to compare players. I’m not sure I have a definitive answer, but I would tend to say, given all the factors during when I saw him, the most impressive player I’ve seen is Mike Trout. Back in 2010, Trout was called up to High-A when he was still 18. We faced him right after his promotion, and he was still adjusting to the new level. Within a month he was easily the most feared player in the league. Even though it came at my team’s expense, he was a lot of fun to watch. What’s the weirdest/craziest thing you’ve seen? Although I saw some interesting things this past season, my 2009 season with the High Desert Mavericks will be hard to beat. I’m not sure anything will top the historic 33-18 slugfest from June 28 of that year. Needless to say, many records were broken that afternoon. I’ll never forget that game, and if nothing else, it resulted in me being quoted in The New York Times. However, just a few weeks before, we played a 21-inning, 7-hour, 34-minute game in Stockton that was split up over two days. Throughout the course of all that, outfielder Jamie McOwen put together an incredible 45-game hitting streak. That season also gave me my favorite unique tidbit of all time. You’ve probably never heard the name Adolfo Gonzalez, but it’s one that will always hold a special place with me. Gonzalez was a utility man for the Inland Empire 66ers, and on May 6, 2009, he was forced to pitch during an extra-inning game. In the 11th inning, he surrendered a walk-off home run that led to a Mavericks victory. Now that isn’t all that unusual, but about a month-and-a-half later, Gonzalez hit a walk-off home run to beat us on June 19. As Milb.com’s Benjamin Hill would say, that’s about as crooked as it gets. Since you’re from St. Louis, that means you’re a Cardinals fan, right? Kinda, sorta. When you enter this business, you don’t have time to be a “fan.” Your rooting interests shift based on the relationships you build throughout the years. The Cardinals are bigger than baseball in St. Louis. I’m not saying it’s more important than most real-world issues, but it is deeply ingrained in the cultural fabric of the city. It’s something you can’t understand unless you grow up there or live there for an extended period of time. Cardinals baseball will always be a part of me, but it’s not even close to what it was when I was a child. However, the Cardinals’ success is directly related to the well-being of my dad and brother, so for that reason alone, it’s nice to see the Cardinals do well. Like anyone else in my position, it would be great to get to the Major Leagues one day. The truth is, no matter your ability, the odds of getting there aren’t good. So I don’t know if I have a “dream” job. I’m happy to be where I’m at. We’ll see where things go from here. Hope that covers all the burning questions. I’ll post one more time before end of the year to focus more on recent Astros moves and how it pertains to the RedHawks. Hello, everyone. I hope this will serve as your baseball-related appetizer before Thanksgiving. Brandon Laird signed a minor league deal with Kansas City. The Astros claimed Ryan Jackson off waivers from St. Louis. He still has options left, and I think there’s a decent chance he’ll be in Oklahoma City in some point in 2014. Jake Elmore was claimed off waivers by the White Sox. J.D. Martinez was outrighted off the Astros’ 40-man roster. If he doesn’t get plucked by someone in the Rule 5 Draft, the odds are good he’ll start the year in OKC. Of course, he could always get re-added before the season begins. Speaking of the 40-man roster and the Rule 5 Draft, the Astros added Asher Wojciechowski, Domingo Santana, and Luis Cruz to the 40-man, thus protecting them from the Rule 5 Draft. (For a simple explanation of the Rule 5 draft and list of Rule 5 eligible players from the Astros, check out this piece by Brian McTaggart. 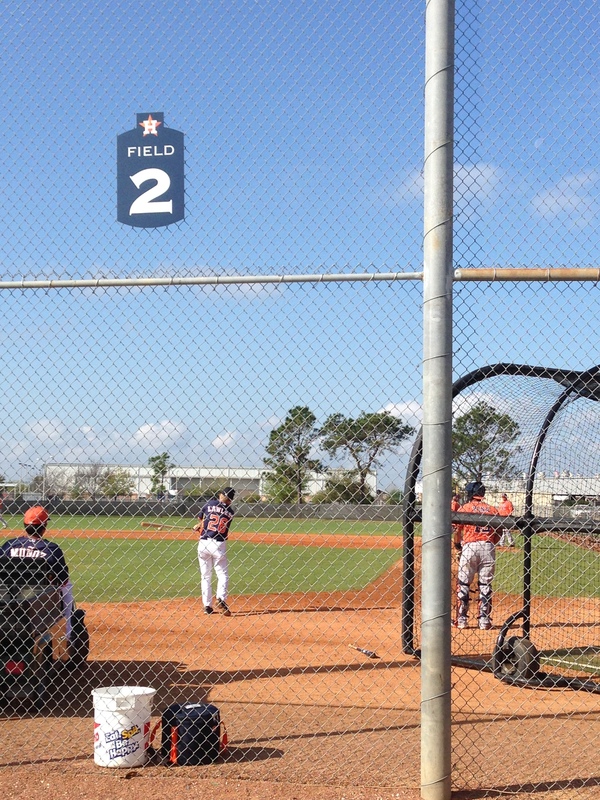 Note that George Springer is not yet eligible, thus why he has not been added to the 40-man.) Wojo will be battling for an Opening Day rotation spot, but he could be back in OKC. Santana is definitely slated to start the year in Triple-A, and Cruz could reach the RedHawks during the latter stages of the season. I have seen a reputable sports news outlet list a couple of different minor league free agent signings by the Astros, but I haven’t seen anything official from the Astros or MLB. I tend to stay silent until that happens. Still no word on the RedHawks coaching staff, but elsewhere in the PCL, Nashville has an opening again after recently-named skipper Darnell Coles took a job with the Detroit Tigers. I imagine he’ll go down as the only undefeated manager in Sounds history. For some, Thanksgiving is a time for reflection. For others, it’s a chance to eat as much turkey, stuffing, and pie as your body will physically allow. For most of us, I would say it’s a little bit of both. For the first time since 2008, attendance surpassed 400,000 fans at Chickasaw Bricktown Ballpark. Chickasaw Bricktown Ballpark was recognized as one of the Top 10 Minor League Ballparks in the country by USA Today. When you consider there’s about 180 or so minor league parks in affiliated ball alone, it’s quite the honor. Nobody ever complains about The Brick, and there’s good reason for that. I can personally attest there’s nowhere else I’ve ever seen I’d rather call my home park. Although the team’s dedicated staff continues to set the bar high for itself, I have no reservations things will further grow and improve in 2014. Thanks for reading. Have a wonderful Thanksgiving and safe travels. 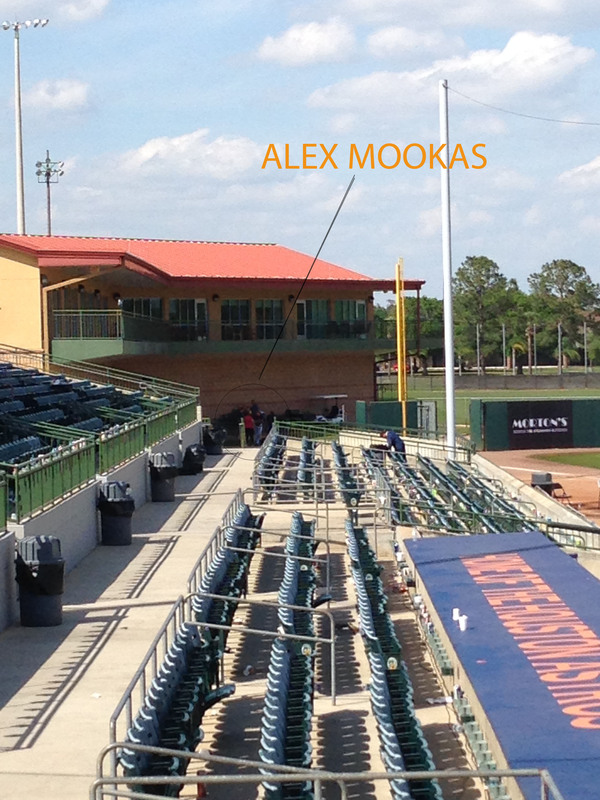 Several 2013 RedHawks–and possible 2014 RedHawks–have been participating in fall/winter leagues, both stateside and abroad. This list doesn’t cover everyone, but mainly guys who have played significantly thus far, as there are a bunch who have appeared in just a scant few games. -Japhet Amador, Peoria Javelinas (Arizona Fall League): 18 G, .284, 4 HR, 12 RBI. After signing late in the year from Mexico, Amador joined the RedHawks for the final few regular season games and the playoffs. I would say these are definitely encouraging numbers as he continues to get assimilated to baseball in the States. Whereas most hitters need to adjust to better off-speed pitches as they advance in their careers, it’s been the opposite for Amador. A couple weeks back I read an article in which he said the biggest challenge was adjusting to better fastball velocity, as opposed to Mexico where pitchers rely mostly on breaking stuff and junk. The mustachioed lefty was the RedHawks’ best pitcher–starter or reliever–over the final month of the season. He’s kept that success rolling in Venezuela, primarily as a starter. After getting off to a great start, Owens succumbed to a stress fracture in his foot in late April and missed the rest of the season. He’s pretty much picked up where he left off, putting up solid numbers. I think it’s worth pointing out 6 of his 14 hits have been doubles. Not surprising Singleton decided to play winter ball after missing the first 50 games of this past season. Everyone in the know is certain 2013 was an aberration for Singleton, and he’ll bounce back next year. Although he leads his team in strikeouts, he also leads the team in walks and has posted a .420 on-base percentage. Very similar to what he did in OKC. Sogard split this season between the RedHawks and Double-A Corpus Christi. While with OKC, he had an up-and-down experience. Sogard’s stuff constantly draws rave reviews, but his command can get him in trouble. Although opponents only hit .234 against him in the talent-rich AFL, he did have 8 walks over 12.1 IP. After a wrist injury ended his season in early June, I would imagine Wates is still trying to shake off some rust. However, he has walked (7) more than he’s struck out (6), which is always a good thing. In his first time managing in Venezuela, Tony D’s squad is currently 15-17 and sits tied for sixth in the eight-team league. The following are 2013 RedHawks who are currently free agents: Hector Ambriz, Cody Clark, Trevor Crowe, Brandon Laird, Che-Hsuan Lin, and Jose Martinez. Pitchers Wade LeBlanc and Philip Humber have signed with the Angels and A’s, respectively. According to Baseball America, the Astros re-signed Jorge De Leon, although the Astros have not announced it. Just like last year, I imagine the Astros will not sign many minor league free agents. 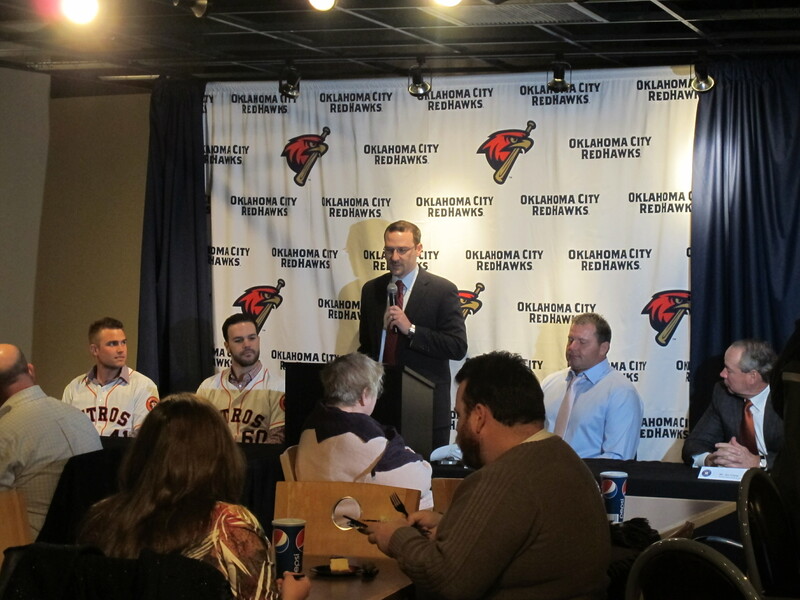 Follow the RedHawks (@okcredhawks) or me (@azfreedman) on Twitter to be informed of relevant signings. Baseball America also has a great Minor League Free Agent tracker to keep your eyes on. 2004 RedHawk–and 2008 Astro–David Newhan was recently named manager of Vermont Lake Monsters, the Short-Season A-ball affiliate of the Oakland A’s. It will be Newhan’s first managerial post. At some point this off-season I will attempt to see how many former RedHawk players are now coaching around the Majors and Minors. We obviously already know of one other. Big news from both of the PCL’s teams in Tennessee. First, the Nashville Sounds are on the brink of getting a much-needed new stadium. You can read all the details here. This has been a long-debated issue in Music City, but it looks like there’s a good shot it’s going to come to fruition this time. I can’t even begin to tell you how much I am rooting for this to happen. Nashville is easily one of my favorite cities in the country. If I could choose to pick anywhere to live regardless of work, it would be Chicago or Nashville. Although I don’t have that many complaints about much-maligned Greer Stadium, a dynamic city like Nashville deserves better. Let’s hope this becomes a reality. Meanwhile across I-40, the Memphis Redbirds announced the team has been purchased by the parent club St. Louis Cardinals. This move had been in the works for awhile and should bring some stability to the organization. 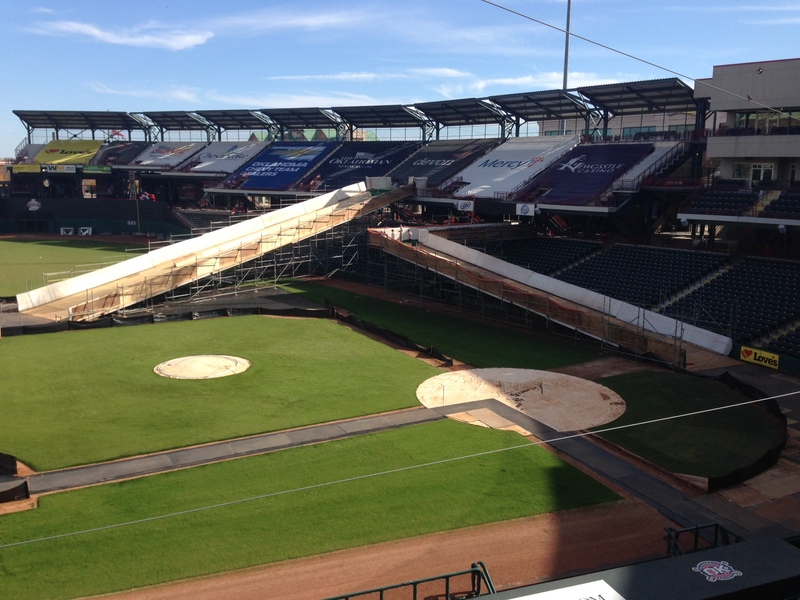 Crews are currently hard at work getting the ballpark ready for Chesapeake Energy Snow Tubing. Hard to believe, but the first public sessions are this Saturday. To learn all about the Downtown in December tradition and how to purchase tickets, click here. The slides are almost done. Next comes the snow! One of my biggest duties during the off-season is running the RedHawks Speakers Bureau. If you are looking for a speaker to attend your next event, feel free to send me an email to learn more. Whether it’s a civic group, school, or any other nonprofit organization, I love getting out in the community to talk baseball. And it’s completely free! We’ll end on this. I have noticed both the University of Minnesota and University of Tennessee football teams have employed “Brick by Brick” as a theme/slogan for their current season. This blog started several months before those schools came up with their “original” idea. The Gophers and Vols will be hearing from my attorney soon. Now that the World Series has ended, the baseball off-season is truly here. But whether it’s working for a team, following winter leagues, or keeping tabs on free agency and player/coach movement, things don’t really ever stop. After taking a look at some of the more memorable, traditional on-field moments in the last post, this time we’ll crack open a six-pack of the more of the uniquely eventful moments the team encountered both on and off the field in 2013. Some of you may know I regularly contribute to Benjamin Hill’s monthly “Crooked Numbers” feature on Milb.com. Needless to say, I’m a big fan of the out of the ordinary. We’re not too far removed from a World Series that had two games–on back-to-back nights, nonetheless–end in unusual fashion. The RedHawks’ loss in Omaha on June 6 ended in a way you don’t exactly expect to see. Leading 1-0 in the bottom of the ninth, the Storm Chasers had runners at first and second with one out after back-to-back walks. Omaha catcher Adam Moore came up next and sent a ground ball to third base, which off the bat appeared to have high potential for a game-ending double play. Brandon Laird fielded the ball and threw to second base to get the force out, but Jake Elmore’s throw to first was errant, allowing the tying run to score. When Elmore played with the RedHawks, I don’t think there was much debate he was the best defensive second baseman in the league. Even though the runner moving to second was not all that close, causing no need for a rushed throw, it was just one that unfortunately got away from Elmore. After an infield single put runners at the corners, pitcher Jose Valdez did the now illegal fake-to-third, look-to-first move. All three umpires immediately called a balk, allowing the winning run to score as the RedHawks sustained a 2-1 defeat. Closing out games in Omaha the past two seasons has been a major bugaboo for the RedHawks. Of their nine losses during regular season play at Werner Park, four have occurred after they led in the game’s final inning. And that’s not counting Game 3 of this year’s playoff series, which saw the Storm Chasers overcome an eighth-inning deficit en route to ending the RedHawks’ season. Now the RedHawks aren’t alone in this regard. Ever since Werner Park opened in 2011, the Storm Chasers have performed extremely well there and have won the American Conference each year. Beginning next season these two teams will be in the same division, so wins at that place will be more crucial…and losses like the one they’ve endured will be more heartbreaking. It’s not all that unusual for a team to use a position player to pitch late in a game that’s out of reach, or if the game lasts several extra innings. But it’s extremely rare to see two position players pitch for the same team in the same game. Well it happened on June 14 against Round Rock. Down 11-2 in the eighth inning, manager Tony DeFrancesco decided to have do-it-all utility man Andy Simunic pitch in order to save some bullpen arms. Simunic tossed a scoreless eighth, but with one out in the ninth, he hurt his elbow. Outfielder Che-Hsuan Lin replaced him and retired both batters he faced to end the inning. Although it was a fun little novelty to see in a blowout loss, it did not have a happy ending. Simunic’s elbow injury turned out to be worse than originally thought, and he did not play the rest of the season. After playing a chilly home game against Nashville on May 2, the team boarded the bus due north to Des Moines. I woke up around 7 a.m. and everything around me was white. We knew there was a possibility there would be snow up there, but you still don’t expect to see it on May 3. During Game 1 of that doubleheader on the 26th, Brandon Laird was a late scratch from the lineup, forcing the RedHawks to make some last-minute changes. In the new lineup, Jason Jaramillo was batting seventh and Andy Simunic was batting eighth. However, when the seventh spot in the lineup came up in the second inning, Simunic was at the plate. He ended up with an RBI groundout. Jaramillo followed and drew a walk, but would not score. At this point, Iowa did not appeal or mention anything to the umpiring crew. When the seven spot in the lineup came up next time in the fourth inning, Jaramillo went to the plate and drew another walk. It was then Iowa’s manager went to speak with the home plate umpire. As rule 6.07 essentially states, the lineup submitted at the beginning of the game is the final lineup, so Jaramillo was batting in his correct spot. Simunic came up next and struck out. Had Iowa appealed in the second inning after Simunic batted out of order, Jaramillo would have been called out, no run would have scored, and Simunic would have gone back to the plate to hit in his correct spot. It caused mass confusion all over the stadium, especially in the press box. It’s just about the worst case scenario for that game’s data stringer–the person responsible for inputting all the computer code in real time which eventually results in this. An event like that sets up an ultimate battle of man vs. machine, which can take a long time to settle. Travel in the Minors, especially the PCL, can be…interesting. In case you’re unfamiliar, teams will travel by either charter bus or commercial flight, depending on the distance. Due to the tight timelines of playing 144 games in 152 days, if one little thing goes wrong or gets off-schedule, it can lead to quite the chain reaction. Everyone has their travel horror stories throughout the Minors, but what occurred between May 15-16 while traveling to Sacramento will be an all-timer. The league does a good job at planning off/travel days when teams make their longest trips. May 15 was a travel day for us, and the plan was fairly simple: fly out of OKC around 6 p.m. to Dallas and then catch a connecting flight to Sacramento. By gaining two hours in the process, we would get in at a reasonable time and give everyone an opportunity to be well-rested for the next day. Our flight was delayed by about an hour due to some rainy weather. No big deal. Our plane arrives, we board, and everything seems fine. The plane was literally at the front of the taxi line, ready to take off when the captain announced that since there were some extremely heavy storms in Dallas, all traffic in and out of DFW had been halted. We went back to the gate and waited for some kind of news. About an hour goes by before they make the announcement that not only had our flight been cancelled, but there were no available flights in the morning. When you’re traveling with a group of about 30 people, this is not an easy problem to solve, to say the least. After some tireless work by Athletic Trainer Jamey Snodgrass and Baseball Operations Manager Mitch Stubenhofer, the new plan was in place: The team would reconvene at Chickasaw Bricktown Ballpark around 3 a.m. in order to bus to DFW and be placed on flights to Sacramento interspersed throughout the day. Fortunately, Tony D and a couple of the players who live on the west coast had gone home after our day game a couple days prior and were able to travel to Sacramento on their own. But the overwhelming majority of players and coaches still had to make their way halfway across the country. Since our group reached Sacramento with no further issues, we knew we would be able to play that night. However, most of the others weren’t so lucky. Almost everyone else was placed on a flight out of DFW to Los Angeles with a connection to Sacramento. The flight to LAX was delayed, and as a result, the group missed the connecting flight. This resulted in further chaos. Guys were sent all over the place, with even some flying to San Francisco and busing to Sacramento. Certain players did not arrive at the stadium that night until the game was almost over. I’m sure there will be some travel maladies again next year because there always are, but it’s going to be hard to top that. There was nothing weird or strange about this one, but it was the best off-field moment of the season and I wanted to include it. 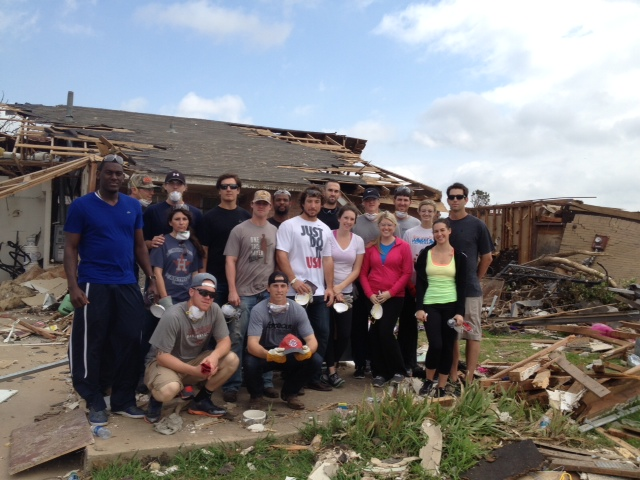 When the devastating tornado struck Moore on May 20, the team was 1,500 miles away in Fresno. Although the team was eager to help, there was one problem: over the next 21 days, the team would be on the road for 17 of them. 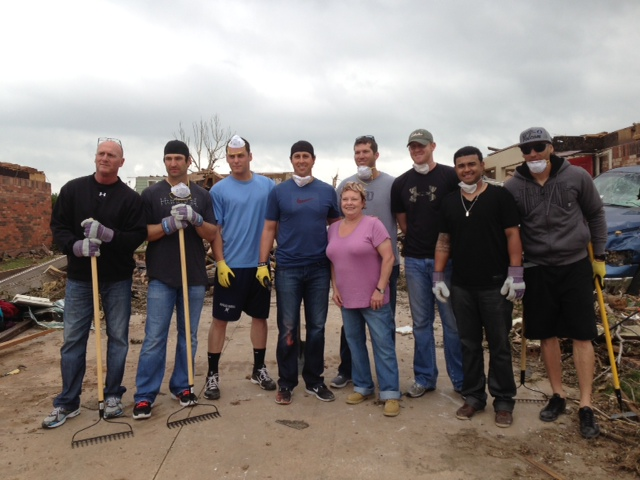 There was a small window during a home series against Omaha, and on May 29, a group of about 12 players and some of their significant others went to assist with the cleanup efforts. Keep in mind this was not something directed or required by the RedHawks or the Astros. This was all initiated by the players, even though their schedule didn’t exactly make it “convenient” to do so. The RedHawks contingent that helped with tornado cleanup in Moore. 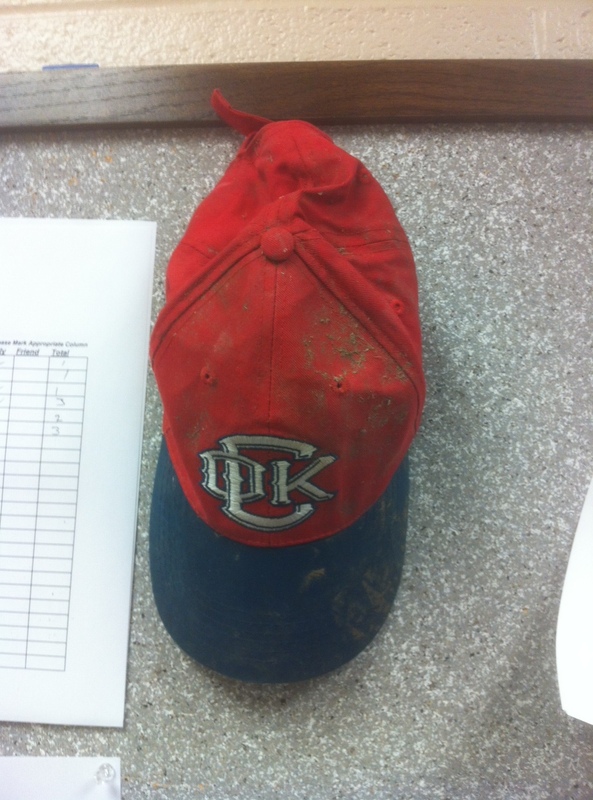 A hat found in the rubble during cleanup. It hung in the clubhouse for the rest of the season. But they weren’t the only ones. A group of Omaha players helped out as well, led by pitcher Everett Teaford. 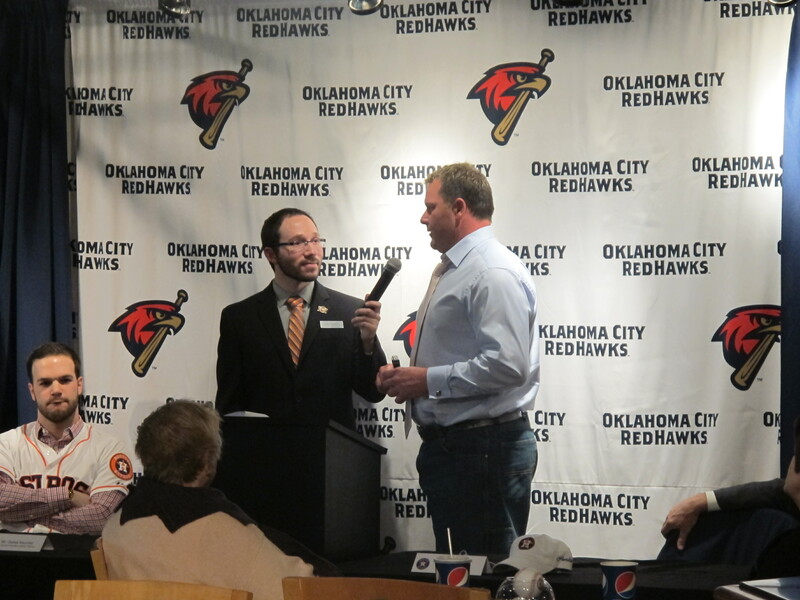 The day after the tornado struck, he called the RedHawks front office to see how he could get involved, knowing the team was scheduled to go to OKC soon thereafter. Members of the Omaha Storm Chasers in Moore. The general sentiment among those who went was that it was a heartbreaking experience, but one they were proud to be a part of and only wished there was a way they could do more. The Storm Chasers’ willing to help was symbolic of how the baseball community responded on the whole. I can’t even begin to tell you how many calls/texts/emails we received in wake of the tragedy. Both Iowa and Omaha also went out of their way to put on fundraisers when the RedHawks were in town to aid the cause. It was remarkable and uplifting to receive support from all over the country. Hope you enjoyed taking a look back at moments. Thanks for reading. Since we’re now about a month removed from the end of the season, it’s time to get this thing back up and running. The 2013 campaign was a very successful one, as the RedHawks won their division, piled up 82 wins, and at one point had a 17-game home winning streak. Now it’s time to take a look back and count down the top 10 moments of the season, at least in my opinion. Plenty of Triple-A players have big league experience, and rehabbing big leaguers are also commonplace in Triple-A. However, it’s not too often you have a chance to face a former Cy Young Award winner in a minor league setting. The RedHawks did just that when they squared off against St. Louis Cardinals great Chris Carpenter in Memphis on July 20. AutoZone Park was rocking that night, with a packed house of around 15,000 red-clad Cardinals/Redbirds fans on hand. In six seasons of broadcasting games in the Minors, it is easily the closest thing to a Major League setting I have ever experienced. Led by Robbie Grossman’s five hits and Jake Buchanan’s six scoreless innings, the RedHawks won that night, 8-1. Carpenter, who has been plagued by nerve issues that causes numbness throughout his body, allowed four runs and nine hits over 3.1 innings. He did not pitch again in 2013, and there’s a chance it might be the final time he pitches at all. Robbie Grossman notched three hits off Chris Carpenter, en route to a 5-for-5 night on July 20. Every season, at every minor league level, it seems every team gets significant contributions from a completely unexpected source. Ruben Sosa was one of those players for the RedHawks this season. The 5′ 6″ dynamo became a fan favorite due to his size, speed, all-out hustle, as well as his local ties since he played at Western Oklahoma State and Oklahoma City University. After a rash of injuries at the beginning of the season, Sosa joined the team from extended spring training and made an immediate impact in his first action on April 7 in Memphis. * He scored the game-tying run as a pinch-runner in the ninth inning on a close play at the plate and then ripped a double in his first at-bat above A-ball in the 11th. Although his first stint with the team was brief before heading to Low-A Quad Cities, he was summoned back to Oklahoma City in late June when the RedHawks had some defections to the Astros during a week in which they were slated to play three doubleheaders in six days. Most figured once the team got past that grueling stretch he would be on his way. Instead, he took advantage of his opportunity and stuck with the team the rest of the year. The most exciting play he was involved in occurred during a day game in Omaha on July 24. The RedHawks were trying to bounce back after the most heartbreaking day of the season. Down 4-2 heading into the top of the 8th, the RedHawks had already rallied for five runs when Sosa stepped up to the plate. He sent a deep drive to right-center field that went to the wall. Once RedHawks manager Tony DeFrancesco saw how far into the outfield second baseman Christian Colon was to receive the throw, he decided to send Sosa home. Sosa beat the relay, collecting the RedHawks’ first inside-the-park home run since April 13, 2010 and the first one ever hit at Omaha’s Werner Park. The guys in the dugout were ecstatic, and the RedHawks went onto win, 11-4. 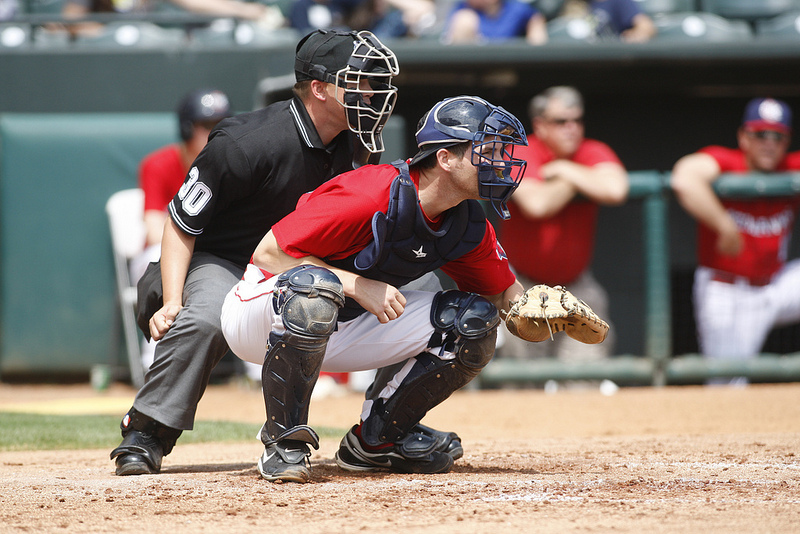 After grinding out 11 seasons in the Minors, catcher Cody Clark made his way to the Major Leagues on August 23. His career has almost always been spent as a backup catcher: Someone who never put up huge numbers at the plate, but was a tremendous asset to have to work with pitchers as well as have in the clubhouse. Due to his lengthy career, and the fact his father has been a longtime staple around college baseball, he seemingly knows everyone. Several players, both in and outside of the Astros organization, have told me he’s the best teammate they’ve ever had. I remember talking with him in Tucson in mid-August when Tucson catcher Chris Robinson, who essentially has had an identical career, got his chance to go up. Cody was so happy for him, and a little over a week later, it was his turn. Granted I’ve only known Cody for a few months, but I’m not sure he’s ever had a bad day. Consider the circumstances right before he got promoted: Due to a number of injuries in Corpus Christi, he actually got sent down to Double-A, a level he hadn’t played at since 2009. His time with the Hooks was brief, as just three days later he was suiting up for the Astros. I got to recently catch up with Cody when the Astros played in Arlington at the end of September. It was awesome seeing him in an Astros uniform, and it was very apparent he was thrilled with the opportunity he had waited so long to get. The RedHawks welcomed the Colorado Springs Sky Sox to town on August 3 by steamrolling them, 24-5. The 24 runs tied a club record, but set a new mark for the most runs ever scored at Chickasaw Bricktown Ballpark. Colorado Springs would cut the lead to 8-4 in the sixth, but the RedHawks tallied 16 runs over their final three at-bats, including a seven spot in the eighth. 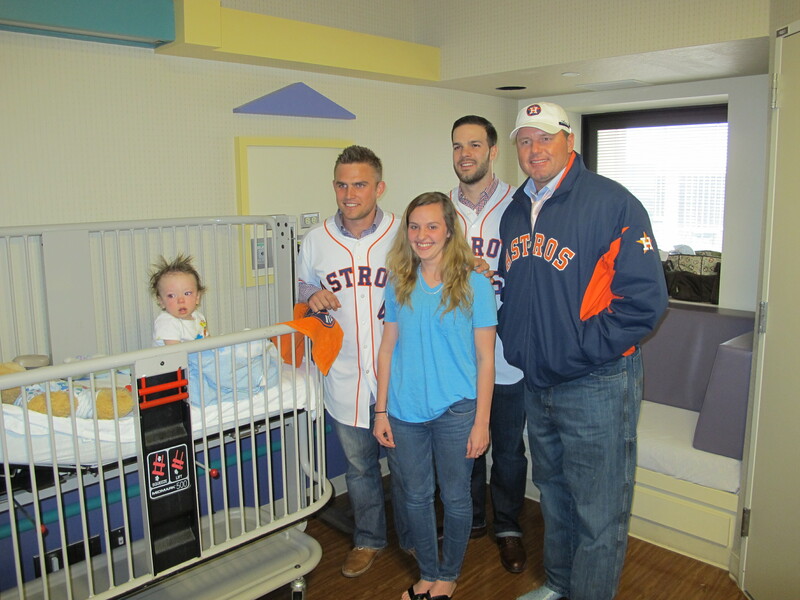 Brandon Laird finished with seven RBI and George Springer scored five times. The offensive explosion was aided by the Sky Sox, who committed five errors, which led to an incredible 14 unearned runs! There’s no way to tell if that’s a record, but I imagine if it’s not, it’s gotta be close. 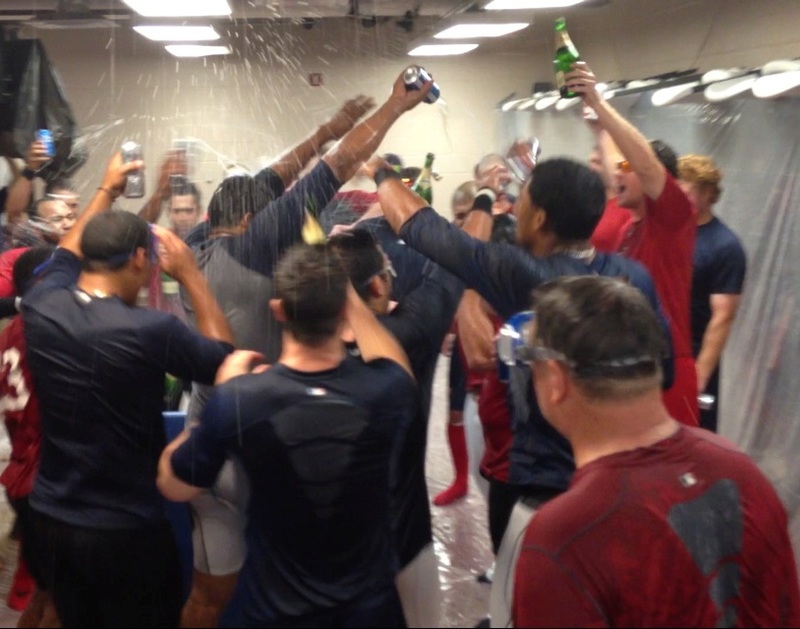 The RedHawks were limping a bit toward the postseason after clinching the division. On September 1 they were on the brink of losing a third-straight game to Memphis, as well as losing for the fourth time in five games since clinching. With Memphis leading 4-0 with none on and two outs in the bottom of the ninth inning, the Redbirds were one strike away from clinching the American Northern Division and ensuring a date with the RedHawks in the playoffs. Folks in the Memphis dugout were all leaning on the railing, and they were all primed to start celebrating. Facing an 0-2 count, Che-Hsuan Lin fouled off a pitch before taking the next two pitches for balls. He then doubled to keep the game alive. Carlos Perez stepped up next, and with a 2-2 count, he singled. The Redbirds were incredulous, but video replay clearly showed it was a fair ball. Still tied 4-4 in the 11th, Martinez came up to the plate again, this time with the bases loaded and a chance to win it. He crushed one that landed on the warning track in the deepest part of the park, but officially went down as just a single. The comeback had huge implications to say the least. Omaha would win later that night to keep their playoff hopes alive. The RedHawks beat the Redbirds the next day to finish the regular season, and Omaha also won, sending the Storm Chasers to the postseason. We know the rest from there: Omaha swept the RedHawks, beat Salt Lake for the PCL Championship, and then beat Durham for the Triple-A National Championship. And it was one pitch away from never happening. One of baseball’s all-time adages is, “You never know what you’ll see at the ballpark.” It speaks to how when you play 144 (or 162) games per year, year after year, you’re going to see eventually something out of the ordinary. And although most of the school kids on hand for the field trip game on May 8 against Tacoma probably won’t remember or appreciate what happened, it will probably be something they will never witness again. The RedHawks scored in the 10th on a throwing error to win, 7-6. It was something else. George Springer didn’t join the RedHawks until late June, but his two-month stay in Oklahoma City was a memorable one. He had hit 19 home runs and collected 23 stolen bases with Double-A Corpus Christi at the time of his promotion. He swatted his 30th homer on August 9 in Las Vegas and swiped his 40th–and 41st–base on August 22 in Round Rock. The next night he hit his 37th homer, and the chase was on with 10 games to go. With a chance to do something that had not been done since 1956–and had never been done in affiliated minor league baseball–everyone had their eyes on Springer. Milb.com even created a whole section dedicated to him. Unfortunately he stayed at 37 home runs, but it shouldn’t take away from what an amazing season he had. He joined Darryl Strawberry and Ruben Rivera as the only two minor leaguers over the past 40 years to hit at least 30 homers and steal 40 bases in a single season. He was just one of two players in the Minors to collect 100 RBI and score at least 100 runs. The only other player to do that was fellow Astros farmhand Andrew Aplin, but Aplin did in a very hitter-friendly home park in Lancaster, within a hitter-friendly Cal League. There were four players in the Majors who also reached the 100/100 mark: Miguel Cabrera, Chris Davis (former RedHawk! ), Paul Goldschmidt, and Adam Jones. So that’s the top two AL MVP candidates, a top NL MVP candidate, and a perennial All-Star. Pretty good company to be in, but you also have to consider Springer did it in just 135 games. None of those guys had reached 100/100 by the time Springer’s season was over. You could argue Springer did reach 40/40 after all. He hit two homers in the Texas League All-Star Game and one more in the PCL playoffs. It’s not like he was facing inferior competition in either instance. I’m not trying to argue against the way official stats are recorded, but it is something to consider. I think one of the best representations of what kind of player George Springer is lies in the fact he was voted “Most Exciting Player” in both the Texas League and Pacific Coast League in this year’s annual Best Tools Survey conducted by Baseball America. He college coach has gone on record to say that he is a “six-tool player” due to his love and knowledge of the game. George Springer provided a lot of great moments, but his inside-the-park home run on July 27 against Iowa is one my favorites. I went back and timed his run. He clocked in at 13.7 seconds. Billy Hamilton, the anointed “fastest man in baseball”, circled the bases in 13.6 seconds during an inside-the-park home run earlier in the year. I told George about that the next day in a joking manner. Although he took the ribbing in good stride, I could also tell he was making a mental note that he needed to work to find a way to shave 0.1-0.2 seconds off his time so he could lay claim as the fastest in the game. Now I can’t tell you how his skills will translate at the Major League level. He might not threaten to go 40/40, but I would be shocked if he doesn’t have a long, successful career. He’s too talented, too hard of a worker, and too much of a respected person for that not to happen. The RedHawks game on July 7 in New Orleans was rained out. Little did we know at the time, it was a twist of fate that set the stage for one greatest performances in team history. With his start pushed back by one day, Asher Wojciechowski took the mound the next night and proceeded to face the minimum during a one-hit shutout against the Round Rock Express. It was the first nine-inning shutout by a RedHawk since 2009 and stands as the only time in team history a pitcher has faced the minimum during a complete game. And he did it on the road, against a pretty good team. Wojo retired the first 15 hitters before Mike Olt led off the bottom of the sixth with a sharp single. After a strikeout, he erased the runner with a double play. Manny Ramirez–yes, that Manny Ramirez–gave him a scare with a flyout to the warning track in left field to start off the eighth. Joey Butler stepped up next and drew a walk, although each of the four balls could have easily been called strikes. On the very next pitch, Wojo coaxed a double play off Aaron Cunningham’s bat to end the inning. He worked a 1-2-3 ninth, etching his place in team history. Wojo went the distance by using just 97 pitches, and he retired the side on nine pitches or less five times. Outside of Olt’s single and Manny’s deep flyout, there really wasn’t another ball hit well all night. Asher Wojciechowski delivers the final pitch of his shutout in Round Rock on July 8. For someone who has never seen a no-hitter or perfect game in person, it’s the most impressive pitching performance I have been a part of. It’s definitely a game I’ll always smile about when I go back look through my old scorebooks. 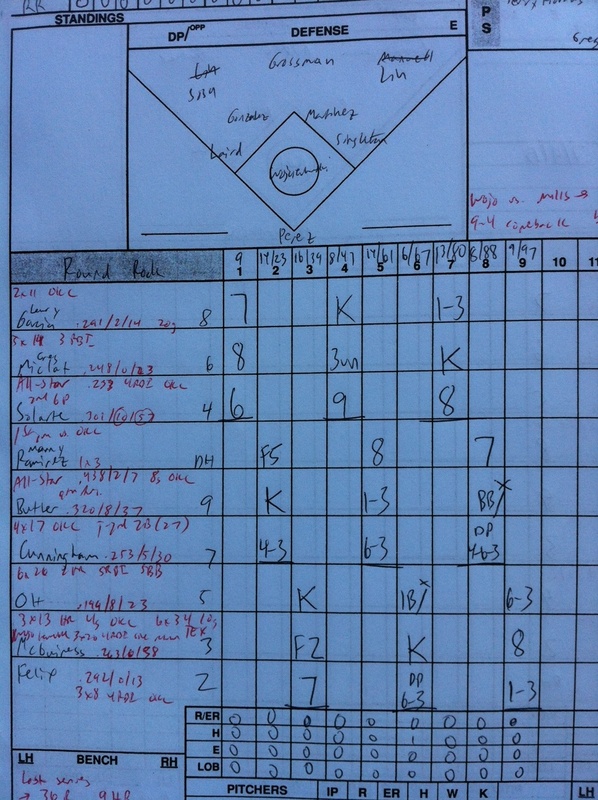 My scorebook from Wojo’s one-hitter. Pretty close to as clean as it gets. Between July 26 and August 20, the RedHawks played 17 home games. They won every single one of them. It started with a 12-game homestand July 26-August 6. I would have been happy with 9-3 and downright thrilled with 10-2. But 12-0? The 12-game winning streak smashed the previous team record of nine, done several times throughout the years. D) Take ride on Party Train. After a tough West Coast road trip that saw the team go 2-6, they returned home to take on division rival Albuquerque in a pivotal five-game series. The Isotopes entered that series three games behind the RedHawks in the standings for first place, but they would gain no ground. The first game had a playoff-like atmosphere as the RedHawks squeaked by, 3-2. The next night the RedHawks would trail for more than one inning (gasp!) after falling behind 1-0 early, but they took the lead for good in the fourth inning. The followed “the script” in games three and four to bring the home winning streak up to 16, but number 17 was filled with drama. 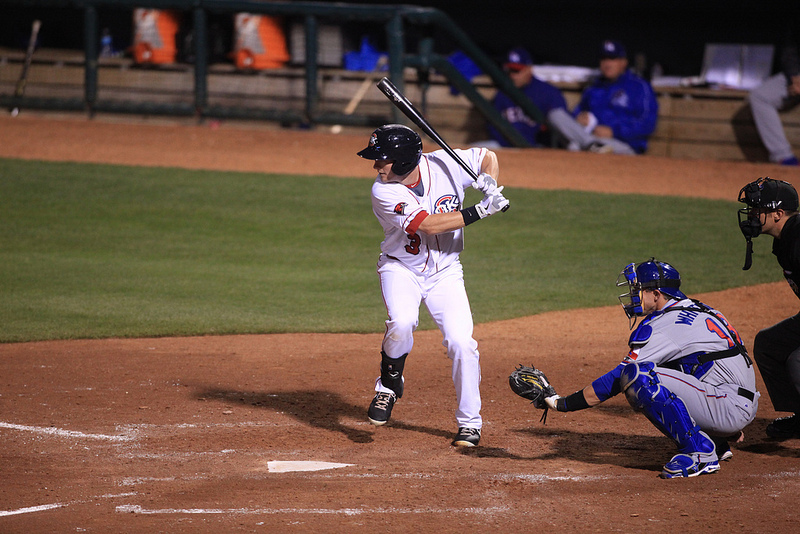 The RedHawks led 4-3 heading into the seventh, but the Isotopes scored twice to take the lead. Up to this point, the RedHawks had never trailed in any game during the win streak past the sixth inning. It would be the final win of the streak before it came to an end on August 26 against Nashville, but what a way to cap it off. The RedHawks ended up going 47-26 at home, including 10 walk-off wins (but no walk-off homers). They are an astonishing 92-52 (!!) at Chickasaw Bricktown Ballpark over the past two seasons. Unlike other full-season leagues within the Minors, the playoff structure in Triple-A is modeled after the Majors. We don’t play halves. If you wanna get to the postseason, you have to be the one atop your division after the 144-game grind. Despite more roster changes than normal for a Triple-A team, the RedHawks won with the interchangeable parts they were given. They went into the All-Star Break five games above .500, but went on a post-break blitz to the tune of 31-16. They ran away with the division by six games after being 4.5 games out of first at the break. The clincher was on August 27 against Nashville. Making a spot start, Eric Berger pitched brilliantly, allowing one run and two hits over five innings and retiring 11 of the final 12 batters he faced. The RedHawks held a three-run lead in the sixth before hanging on for a 5-4 victory. It was time to celebrate in Bricktown. The best and worst day of the year for a clubhouse manager. It was the seventh division title in team history and the first under the Astros affiliation. Since joining the PCL in 1998, only Sacramento has won more division titles than the RedHawks. The playoffs did not turn out the way anyone would have liked but it does not diminish the team’s fabulous season. 2013 provided a lot of great memories, and these were just 10 of the best. That’s all for now, but I can tell you the next post will take a look at some of the year’s more unusual moments, both on and off the field.